Hey lovers of the outdoors! 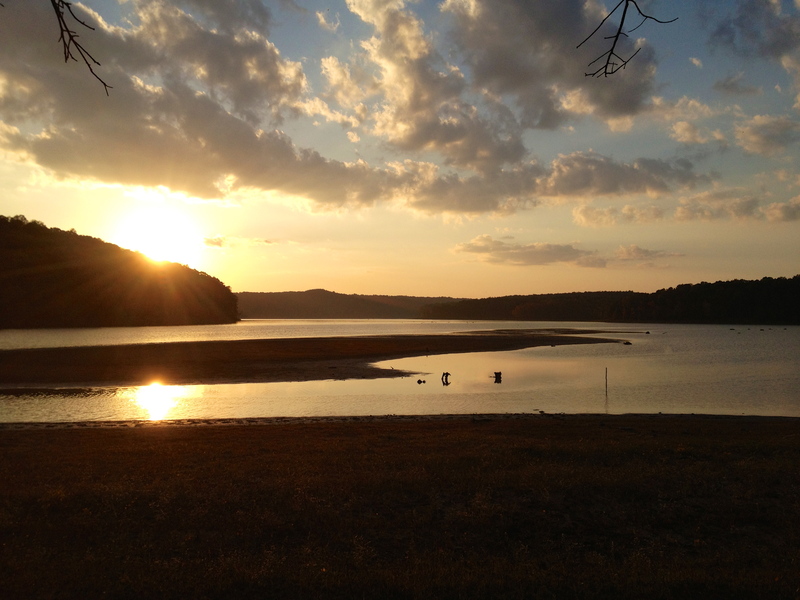 I wrote a new post on my other blog entitled All Creation Sings. I recount a specific moment in Alaska when summiting Mt. Eielson when I saw Denali for the first time. It is a faith post, so if that’s not your thing you may choose to disregard… but I thought you each would identify with the emotions that I share in the post. Btw… I am heading to Wrangell St. Elias NP in Alaska at the beginning of August for a week in the wilderness. New trip reports will be coming then. I have done several multi-day hiking/camping trips in which the daytime and nighttime temperatures were consistently at or below 20 degrees Fahrenheit. I have several things that I do, not only to stay warm, but to also insure that I do not get hurt or become hypothermic. In this post I want to share some ideas that may help you if you are considering hiking/camping in freezing conditions or if you consider yourself a novice who is still learning. 1. When you are cold…move! The logic here is relatively straight forward. When you are not moving or exercising… and as the outside temperature begins to plummet… your body begins to protect essential organs. Blood circulation centrals around essential organs and limits the amount of blood circulated to extremities. But, as you begin to move or exercise, your heart rate increases and your blood begins to circulate rapidly throughout your entire body, which also begins to warm your fingers, toes, hands, and feet. When I am stationary and begin to lose sensation in my fingers and toes, I begin moving. I do jumping jacks, push ups, and other activities that get the blood pumping. In my opinion, the very best solution (other than going indoors or starting a fire) is to put on your pack and begin hiking. Within 20 minutes of active hiking, you will warm up considerably and will feel the blood pulsing into your hands and feet. 2. Refuse the urge to wear multiple layers of clothing. I know, I know. This one is extremely counter-intuitive. You may think that it would be a better idea to wear as many layers as possible in order to stay warm, but as soon as you are ready to begin your hike try to remove your jacket or your outer layer. At that moment you will want to resist that idea BUT, I promise you, when you get about 15-20 minutes into your hike you will have to stop and remove the layers anyway because you will be too hot and likely very sweaty. You will be able to handle 15-20 minutes of cold before you begin to warm up and you will also reduce sweating, which is a cold temp no no. If you have read my other posts in the past you will know that I take a lot of precaution and do a lot of planning before hiking/camping trips. I do not like surprises. When hiking/camping for an extended period of time in freezing conditions, do everything you can to reduce how much you sweat. Sweating in freezing temperatures (without proper precaution) may lead to hypothermia or hypothermic symptoms. Like I said above, reduce the number of layers you are wearing while hiking. However, if you begin to sweat excessively while wearing one or two layers, take an opportunity to dry off or change shirts. If you end the day with wet clothing and no way to warm up, you could be in real trouble. Be smart, and take proper precautions. Of course I have a mummy sleeping bag in which I sleep, but I also like to sleep comfortably even in single digit temps. Set a softball sized rock next to your fire about an hour before you plan to go to bed. Make sure that it isn’t too hot to hold and then take it with you as you get into your bag. Depending on your comfort level, you may put it at your feet inside the bag or you may cradle it close to your tummy area. When you cinch your mummy bag at the neck… all the radiating warmth of the rock will be trapped in the bag. You can thank me later. Last year as I was readying for bed… my zipper broke on my mummy bag. It was around 7 degrees Fahrenheit. I moved the seam underneath of my body and then cradle my warm rock. I had about 6 hours of toasty warm sleep. This suggestion is really simple. Keep food in your stomach. The energy that is being used to digest the food creates heat… so eat. 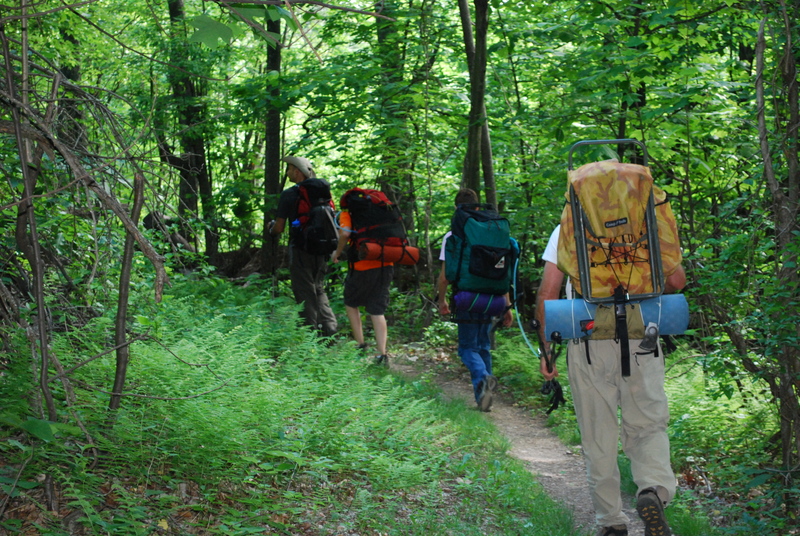 Have snacks while you are hiking and make sure to eat something before you go to bed at night. These suggestions are more about convenience than life-or-death, but they will definitely help you out. At night when you get in your mummy bag, keep your gloves, cell phone, and/or contacts in the bag with you. The next morning you will be thankful for warm gloves to start the day, a cell phone that does not have a drained battery, and/or contacts that are not frozen. Also, keep in mind that water freezes below 32 degrees. I know you know that! But you may forget to keep your water bottle close to you and it may freeze solid. Yes, that has happened to me… and you can’t drink a block of ice. So make sure to keep your water close to the warmth of your body. I would love to hear what you do as well! Share your secrets to staying warm in freezing conditions in the comments section. I guess I should also say that I am NOT a medical professional, nor should my advice be taken in matters of life or death. The above suggestions have not been authorized by a medical or safety professional. They are simply my opinions. 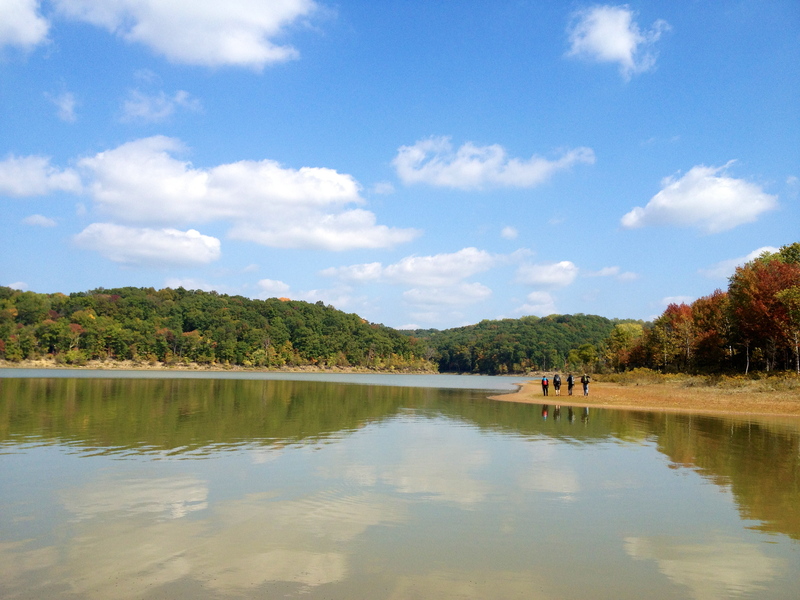 We recently took a weekend guys hiking/camping trip to Charles Deam Wilderness, which is south of Bloomington, Indiana and nestled right up against the Hoosier National Forestry. If you remember… a handful of us braved a single-digit weekend excursion to Deam this past January, putting all of our survival skills to the test! 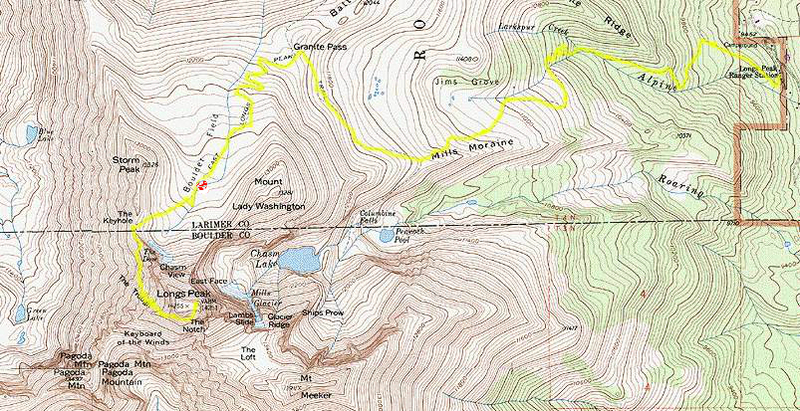 In January, we navigated Axsom Branch as well as portions of Grubb Ridge Loop. 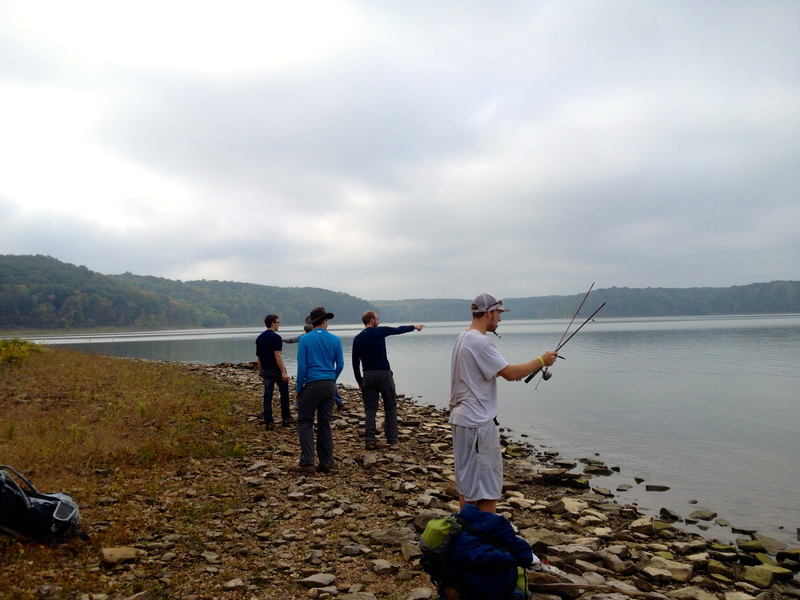 This time we set out without any sort of plan, except that we wanted to spend some time on Monroe Lake. We parked at the parking lot southwest of Axsom Branch and headed northwest on Grubb Ridge Loop. Being that we started the hike in the evening, we didn’t want to be too ambitious. 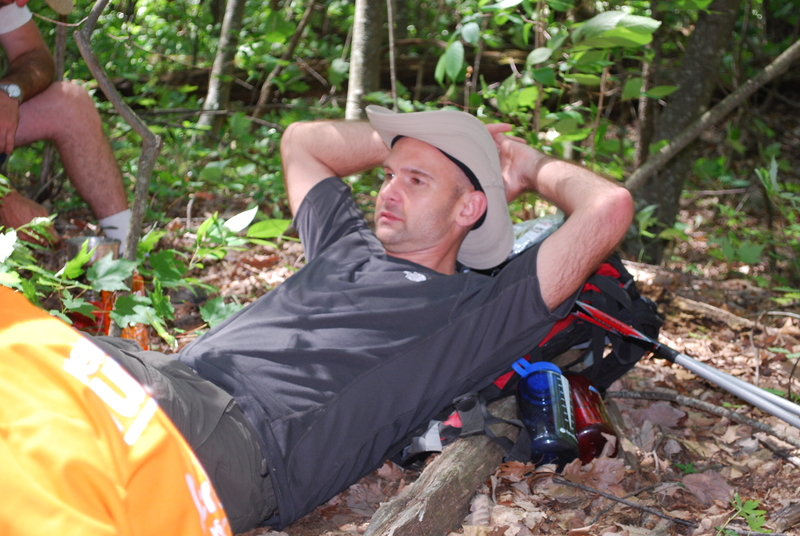 Our goal was to set up camp close to the split of Grubb Ridge Loop trail and the Peninsula Trail. The temperature that autumn evening was a fantastic and cool low 60’s with a low overnight in the high 40’s (perfect Indiana camping weather). 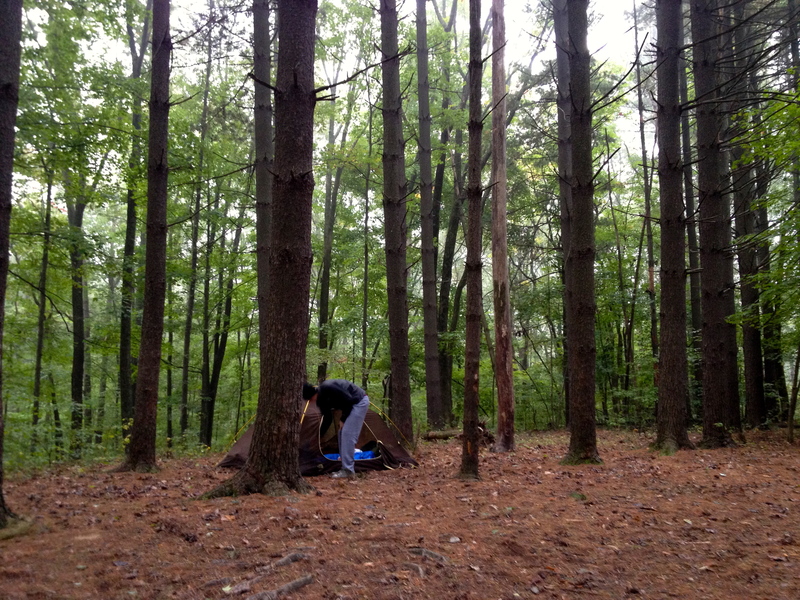 We set up the tents in a really nice area with thick pine needle covering and spent the late evening around a fire. The next morning we decided to continue on the Peninsula Trail until we hit the end of the trail at Monroe Lake. We took our time packing up and got a late morning start. With no agenda, our only goal was to enjoy our time venturing through the wilderness. With many of our trips it seems as if we are always moving and trying to get to the next destination at a reasonable time to set up before sun down. It was actually really nice to take our time. 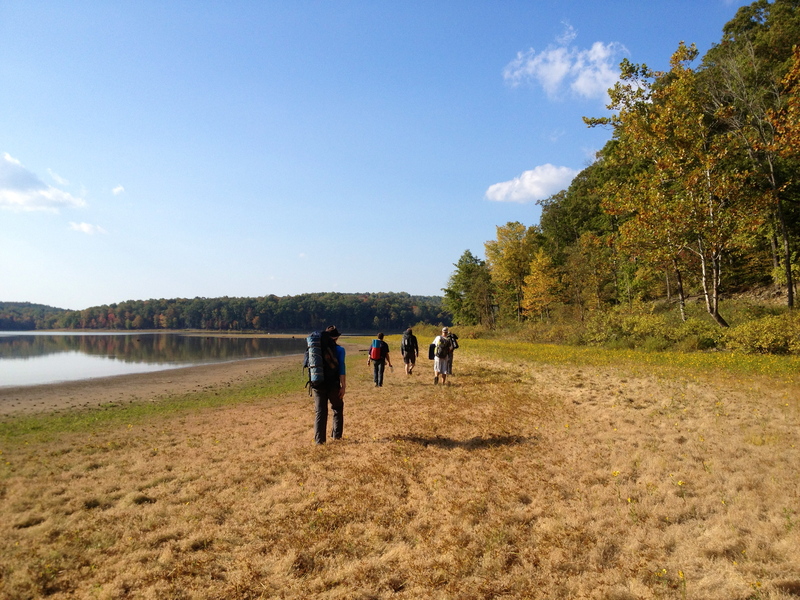 It was around noon when we made it to the end of the trail at Monroe Lake. 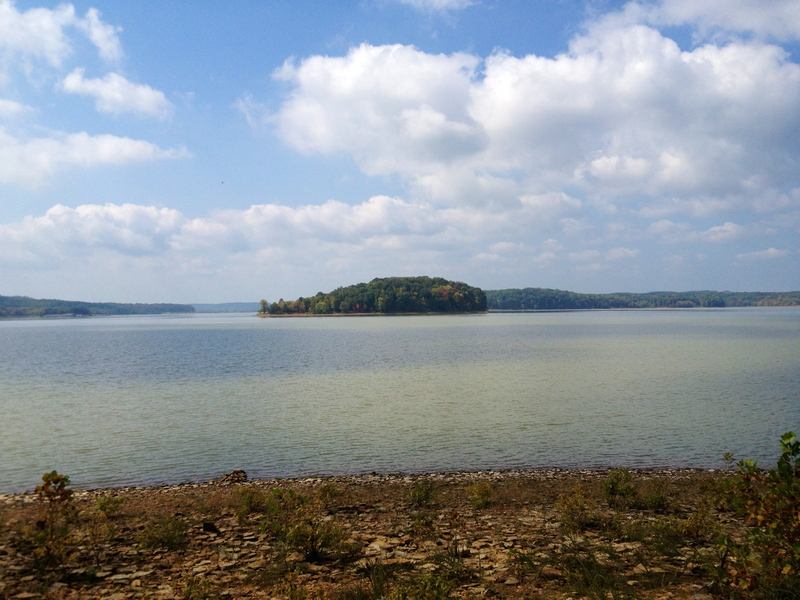 As I looked out into the lake I saw what appeared to be an island about 1/2 mile offshore. I jokingly commented that we ought to swim out to it. And of course a few guys got really serious about it. For the next ten minutes they were just waiting for someone else to say let’s do it! I finally began to take off my boots and socks, “Let’s do it boys.” We stripped and gingerly made our way over the jagged rocks to the lake’s edge. We began to wade slowly into the cool water and then just began to swim. Our amateur voyage to the island took about 40 minutes and we were all glad that the swim was over. We walked on the other bank, looked at each other, and then wondered aloud how we were going to get back to the other side. 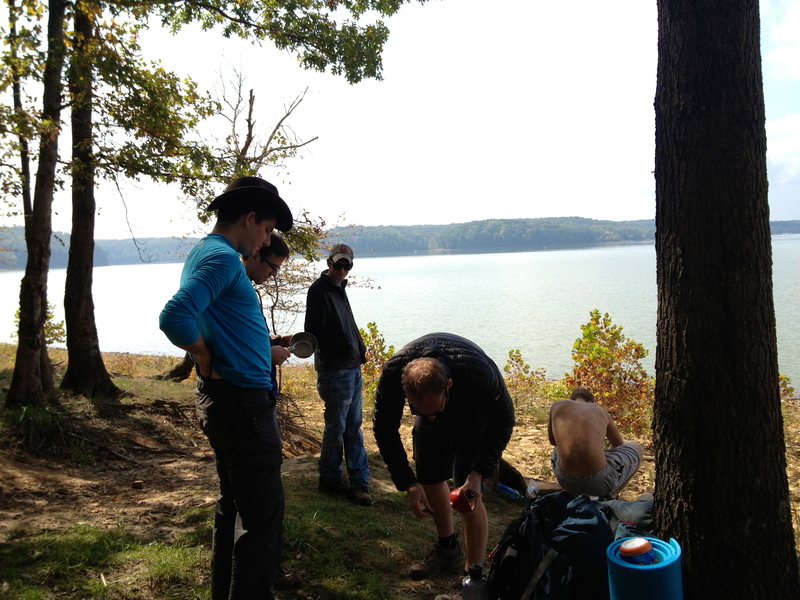 After lunch, we decided to stay along the lake side and hike to one of the campsites on Monroe Lake. This was a stunningly beautiful hike along the lake. 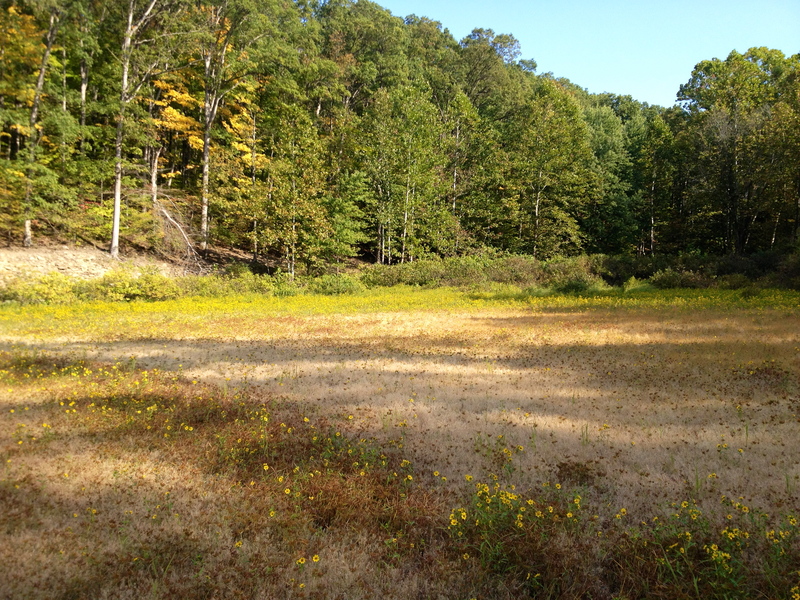 The sun brought out all of the early fall vibrancy- the yellows, greens, and browns. Just being able to breath deep and enjoy such beauty recharges one’s batteries and refills one’s soul. As much as I would highly recommend this particular hike and route, there were a couple of things to take into account. Our decision to hike along the lake overall was a good idea because we didn’t have to backtrack at the peninsula. However, there were about four areas where we no longer had a path to walk so we had to hike up the steep hill, walk through the woods, and then back down to a walkable path on the lake’s edge. Maybe the greatest challenge hiking along the lake’s edge was when the terrain turned almost exclusively into an angled pathway comprised of wet shale rock. It was incredibly slick and we had at least two or three guys slip and fall. The final thing to take into account is pumping water. We brought our pumps and at our final camping destination we went into the lake to pump. It was a slow and laborious process because the water was so green that we had to clean our filters several times to get a few bottles of water. Nonetheless, the sunset on Monroe Lake was exquisite and it was a joy to watch it settle in behind such a magnificent backdrop. I remember sitting outside of my tent, which was set-up right smack in the middle of the roughest terrain I had ever camped, and thought- Am I on Mars? 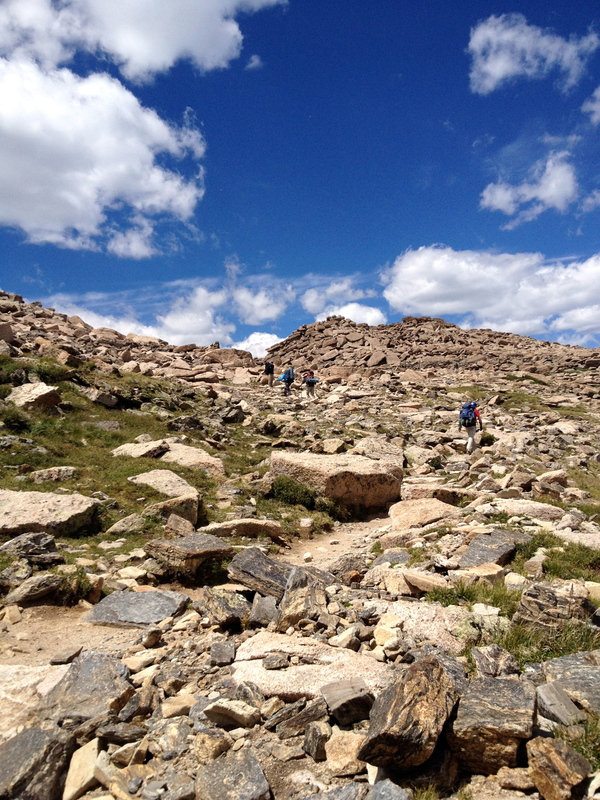 The Boulderfield is located on Long’s Peak Trail at 12,750 feet above sea level. It is one of those places where pictures just can not adequately describe. You just have to go there yourself to see it. And believe me… it will not let you down. 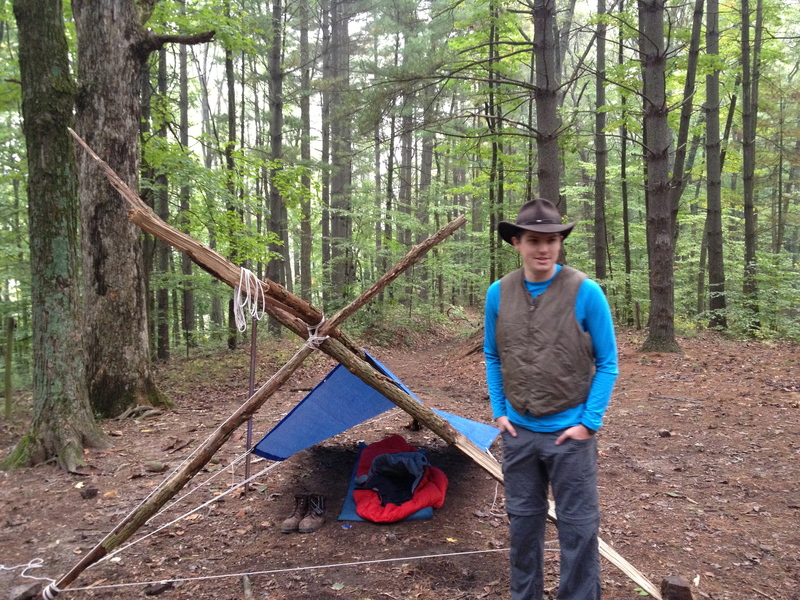 While it certainly is the hardest terrain on which I have ever camped, it was the most gratifying. The most difficult thing about simply looking at pictures of the Boulderfield is that one can’t appreciate the scale of the picture, the enormity of the rocks, or the vastness of the entire field. The only way to appropriately contextualize the pictures is to see a person or an object in the very midst of the field, especially from a distance. 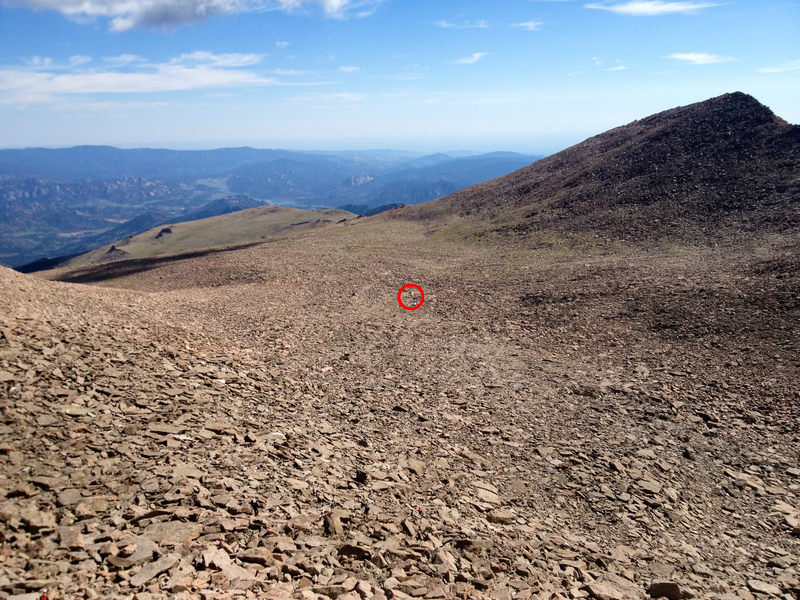 In the picture below, the red circle contains a cluster of tents including my orange and brown North Face tent. 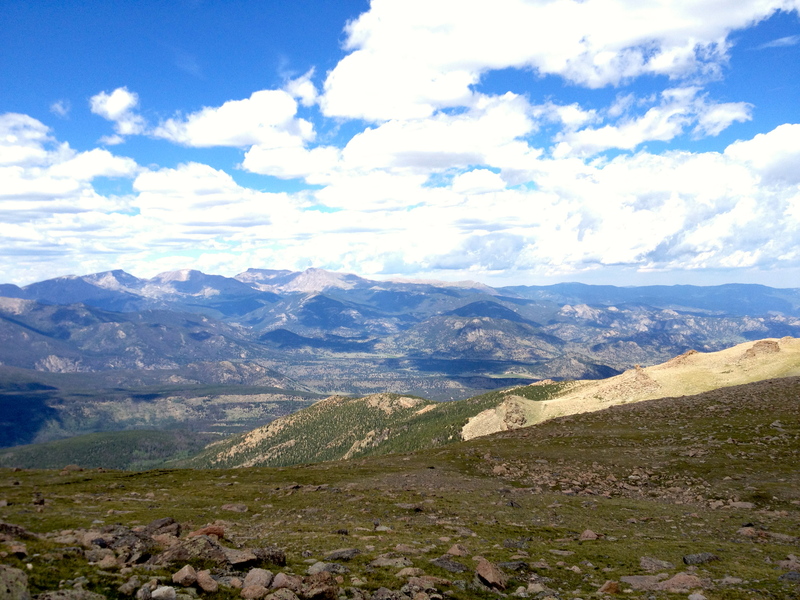 This picture was taken from the Keyhole (only a few hundred feet above the Boulderfield). 1. There are a limited number of designated camping spots in the field. I would suggest registering months in advance to guarantee that you have a spot. However, my impression is that the Boulderfield is easier to get a camping site than other backcountry sites because more people tackle Long’s in one day and do not want to deal with the hassle of packing extra weight for tents and gear, but I would still HIGHLY RECOMMEND camping there for the experience and registering in advance. The individual spots are not marked and they are nearly impossible to figure out on the official Boulderfield camping map, so just make sure that you have your paperwork with you when you select a spot. 2. 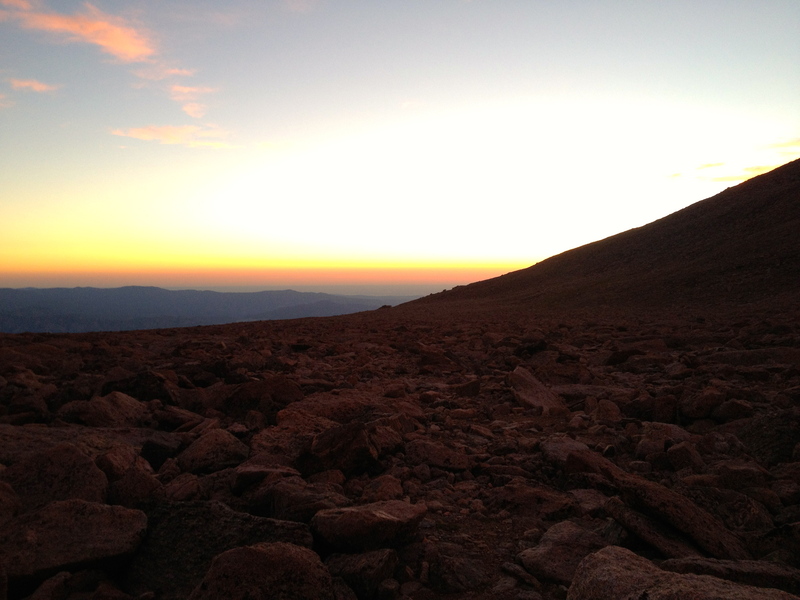 The temperature at 13,000 feet can drop significantly at night. 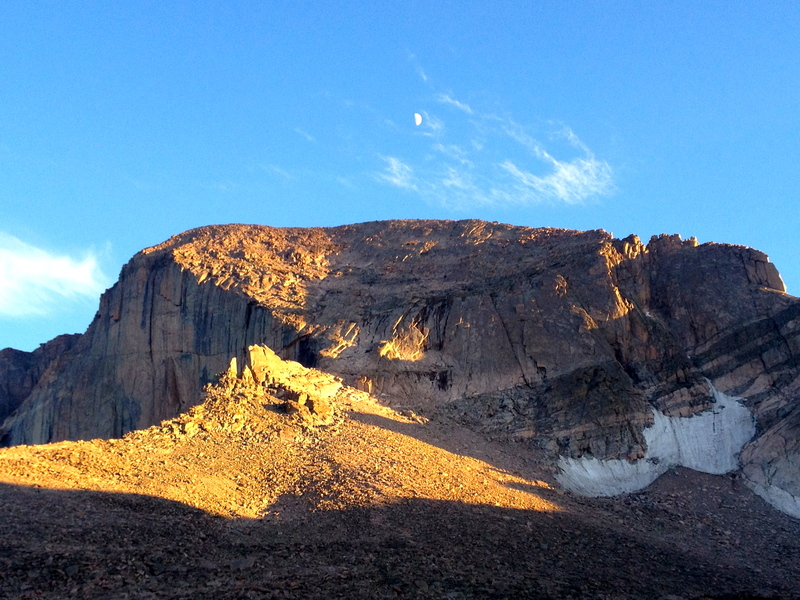 During our end-of-July trip, the Boulderfield low the night we camped there was 47 degrees. Being that building fires are prohibited in the Boulderfield (there isn’t anything to burn in the Boulderfield anyway), it is wise to take appropriate clothing. During the day when we arrived in the field I was wearing shorts and short sleeves, but as the evening approached I zipped on pant legs and then later added sleeves, and then a sweatshirt, and finally a windbreaker. Maybe it was overkill, but I really got chilled. I eventually went into the tent at 10pm in order to warm up in my mummy bag. Without proper clothing and protection, I believe that a person will be extremely uncomfortable and could potentially become hypothermic. Plan well. 3. Running water is available at the Boulderfield, but it must be filter-pumped or cleaned with iodine tablets. This is important because if you plan to make a summit attempt you will want to take a minimum of 32 ounces with you, and you will have likely consumed most of your water on the trek to the Boulderfield the previous day. At high altitude, you have to stay well hydrated. Make sure that you plan accordingly. The greatest piece of advice I will pass along for the Boulderfield is stay awake to see the stars at night! I had every intention to stay awake, but as I mentioned earlier I was cold and decided to go to sleep. It was a bit cloudy that night anyway and seeing the stars was limited. FORTUNATELY for me I woke up in the middle of the night because I had to relieve myself. My general rule of thumb when camping in the cool/cold is if it is before 3am I will get up to relieve myself (otherwise it is too long to hold it), but if it is after 3am I will suffer through it. I figure that the discomfort of having to pee is less than the discomfort of stepping outside the tent in shorts and t-shirt in the cold. Anyway, it happened to be 1am which meant I had to get out of the tent to go. When I stepped out of the tent I was completely frozen in my tracks as I looked up to the sky. I have never in my life seen such beauty as I did that night. So much so that I stood in the cold in the shorts and t-shirt for 20 minutes just staring upward. No city lights competed with the light coming from the distant stars, planets, and what looked like other galaxies. No joke. I have NEVER seen anything like it EVER. I turned to my left and saw the Big Dipper. I felt so close that I could almost reach out and touch it. It was a spiritual experience. Praise God. I only hope others will get the opportunity to experience that as well. 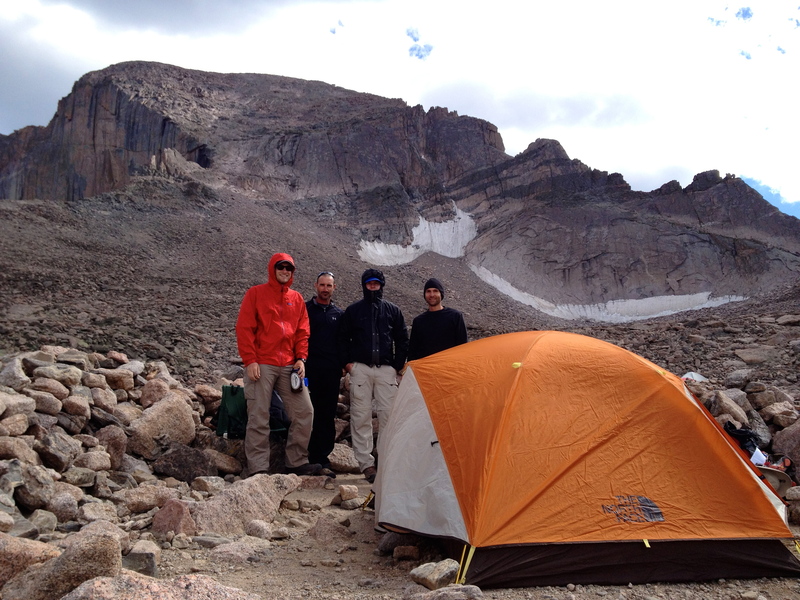 We woke up early on Thursday to make our way to the parking lot and trailhead (TH) for Long’s Peak Trail. 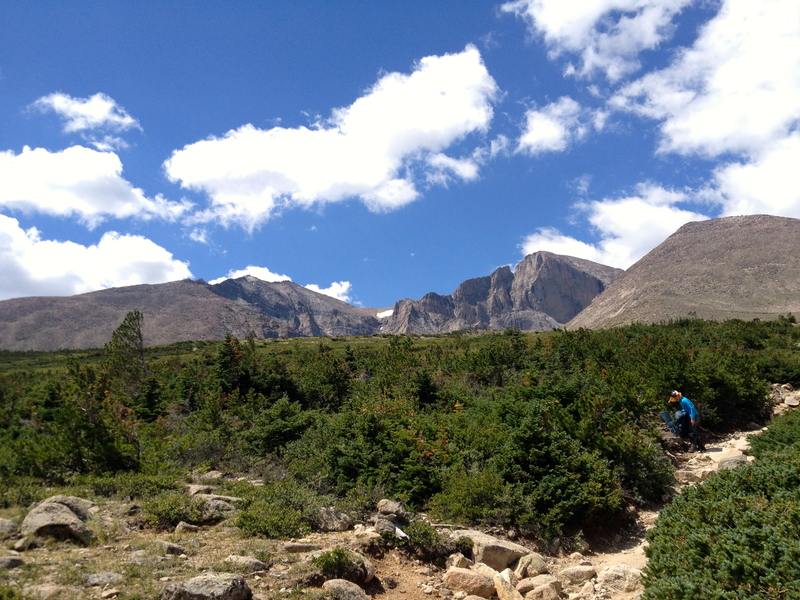 The day before we had just finished the 25-mile North Inlet/Tonahutu Loop trail which was simply spectacular, but summiting Long’s Peak, towering over the park at 14,258 feet was going to be an adventure. 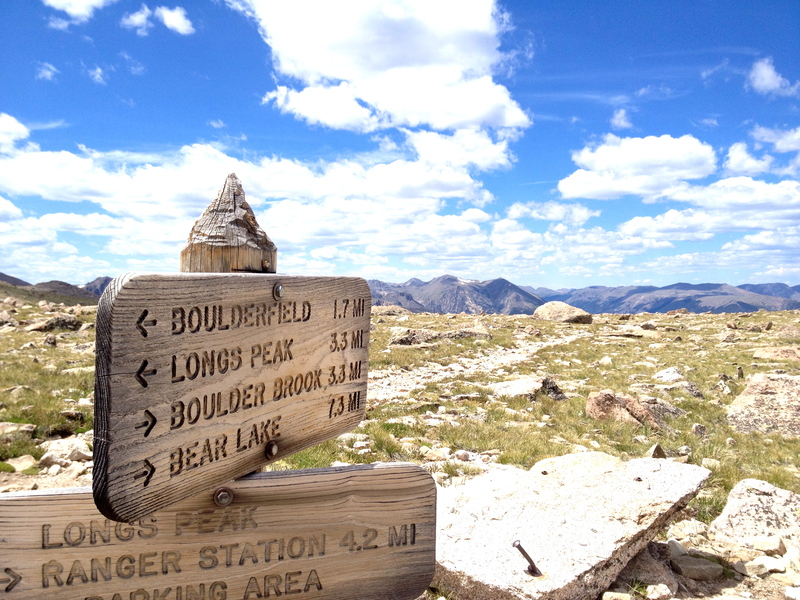 The first leg of our journey would take us to the Boulderfield which would involve nearly a six-mile hike and a climb near 3400 feet in elevation. 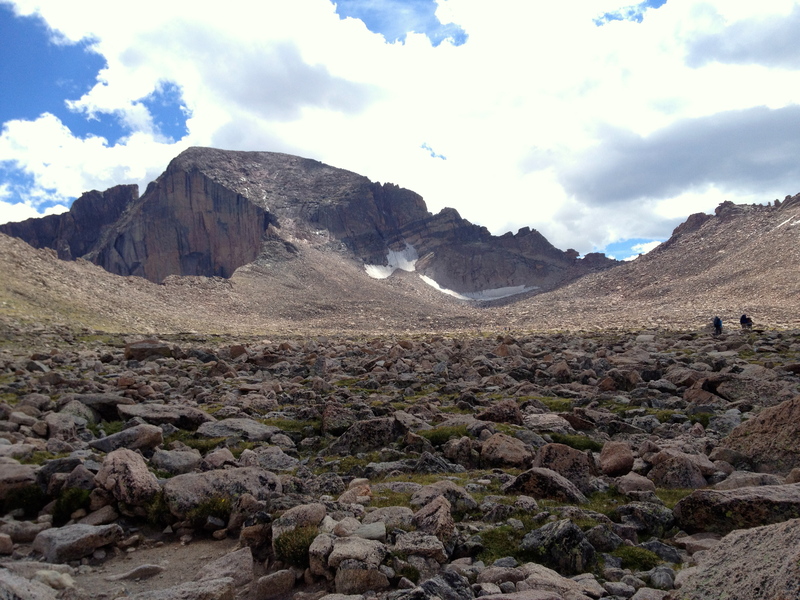 The journey to Long’s Peak (via the Keyhole Route) is quite an endeavor. Before I discuss the details of this hike I would like to share a few thoughts. This is not an easy or casual hike. It is tough terrain that involves a lot of physical exertion for many miles. Additionally, people have died trying to summit Long’s when proper precaution has not been exercised. Don’t get me wrong, I am not trying to dissuade anyone from hiking this trail. I am simply saying that, while this is a very popular peak to summit, do not just show up and start hiking. Do your homework and be prepared. – Wear (and potentially pack) appropriate gear. 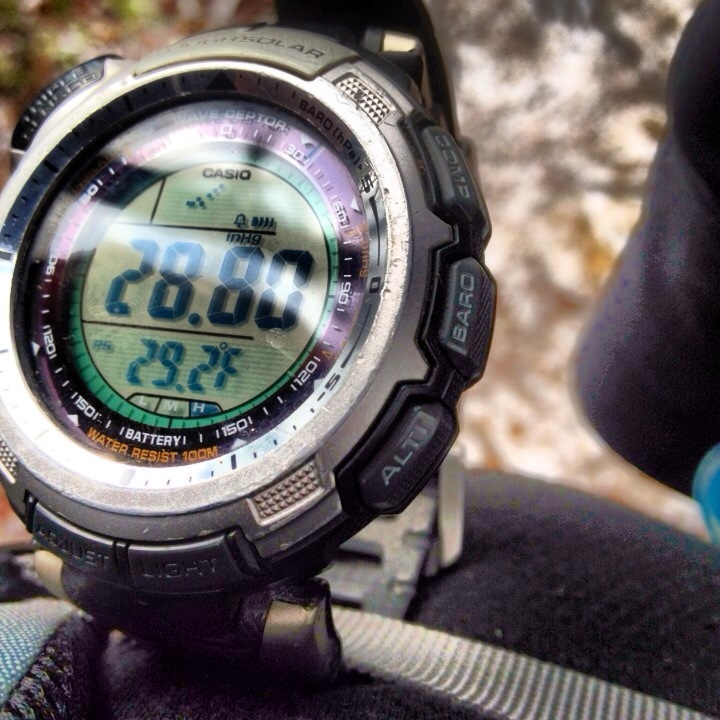 The temperature swing from the TH to the summit may surprise you. Be prepared with sleeves and long pants. – I would HIGHLY recommend sturdy hiking boots. Leading up to the Boulderfield and beyond you will thank me for this advice. It is very rough terrain. Headgear and sunglasses are also recommended. – Take plenty of water. 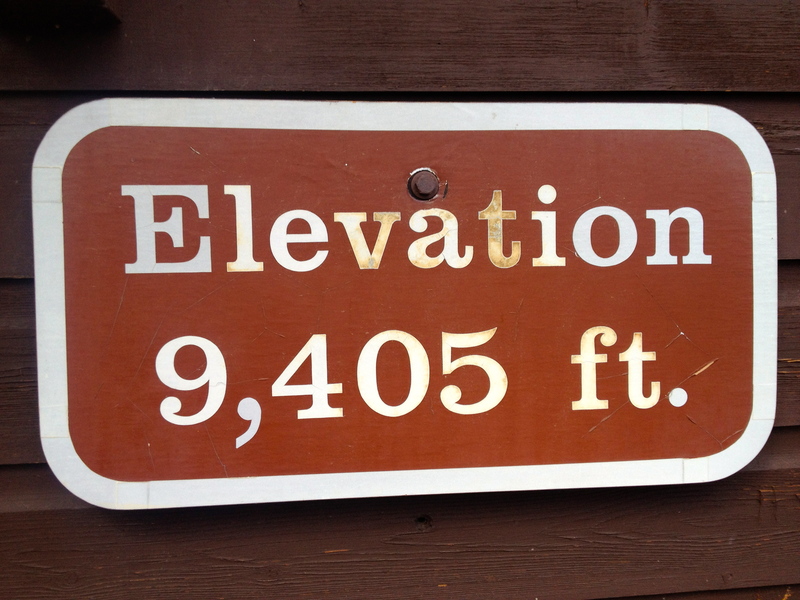 This is a long hike with a significant altitude difference. Dehydration is a serious concern at higher elevations. If you have a pump, the Boulderfield has accessible water to pump. – Make preparations to summit and be below the tree-line before early afternoon, as afternoon showers typically roll in with lightning. – If it has been raining or is continuing to rain, I would not pass the Keyhole or continue to the summit. Many people have fallen off of the shear cliffs to their death because of wet and slippery conditions. The same can be said for wind. If it is a really windy day, take precaution. It is not worth risking injury or death to reach the top. – Follow the designated route to the summit. There are bulls-eyes marking the best and recommended route while scrambling over the rocks. Always know where your next bulls-eye is located and go straight towards it. Not following the suggested route can, once again, put you in a very precarious situation leading to injury and potentially death. – Before beginning your hike, talk to the ranger at the trailhead to get up to date information about the trail and conditions. Despite the significant elevation gain from the TH to the Boulderfield, it is made easier in that it is a gradual incline over six miles rather than a steeply graded incline. That definitely makes this trail more enjoyable to hike. Be prepared for a lot more people-traffic going up and down Long’s. The alpine hike continues for over a couple of miles before it breaks out around 10,500 feet into Mills Moraine and then onto Granite Pass. You will know why the Rockies are called the Rockies when you get to this area. 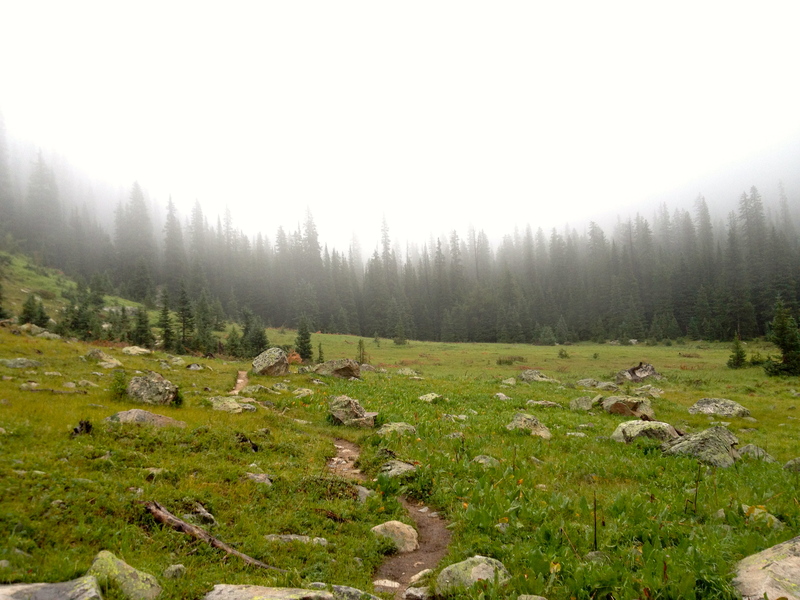 As we approached the Boulderfield in the early afternoon, I had a lot of different feelings. I was relieved to be at our end destination so that we could set up camp and get ready for our summit attempt the next morning. I was overwhelmed by the Boulderfield and how surreal it was to be hiking in a place I had studied about for so long. And then, I was confused and a bit frustrated as we approached the reserved camping spots and noticed that many people had already pitched their tents. What made this frustrating is that none of the spots were marked in any way and it was hard to determine who was supposed to camp where. Ultimately, after much investigated and talking, we decided to simply take two open spots. We had our reservations and the appropriate paperwork, so we wouldn’t have any problems anyway. We decided to stay overnight in the Boulderfield for several reasons, but the main reason being that it is just a REALLY COOL place to camp. In my next post I will write about the Boulderfield specifically. After going to bed at 7pm because of the pouring rain on Day 3, we awoke the next morning with clear skies overhead. In terms of elevation, the last leg of the North Inlet/Tonahutu Trail was almost entirely downhill. 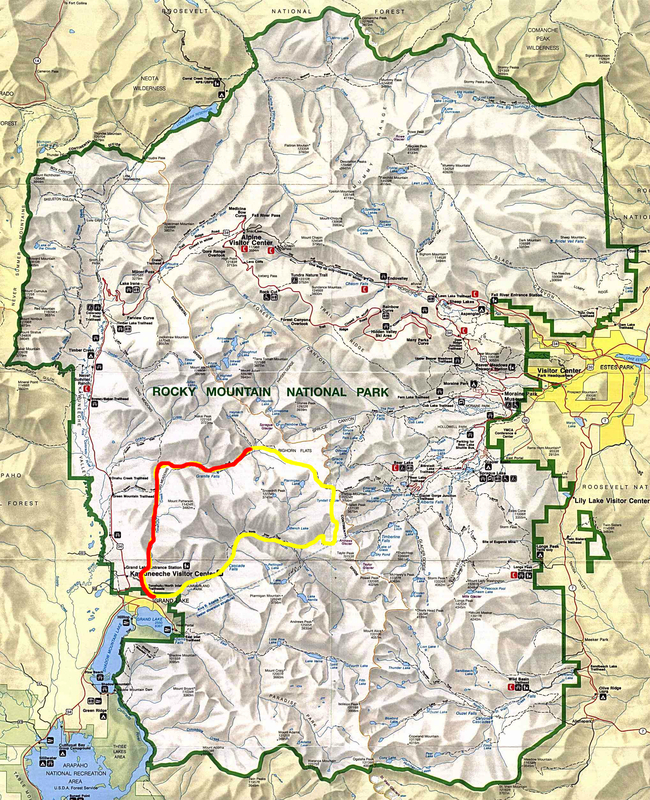 In fact, this final 9.2 miles would take us down 3000 feet through Big Meadow and back to the North Inlet/Tonahutu TH. This was one of the toughest mornings. Of course it was really wet when we got out of our tents, but then packing up our wet stuff is another thing. The sun would not be offering any help because it was still hiding behind the mountainside. This is more of a reality for this area than what we experienced throughout the entire trip. We were really fortunate that we did not get rained on more. I would advise anyone backpacking in Rocky Mountain National Park to always have a raincoat accessible at the top of your pack. The coolest thing about the North Inlet/Tonahutu Loop Trail is that you get a ton of variation and diversity in terrain. 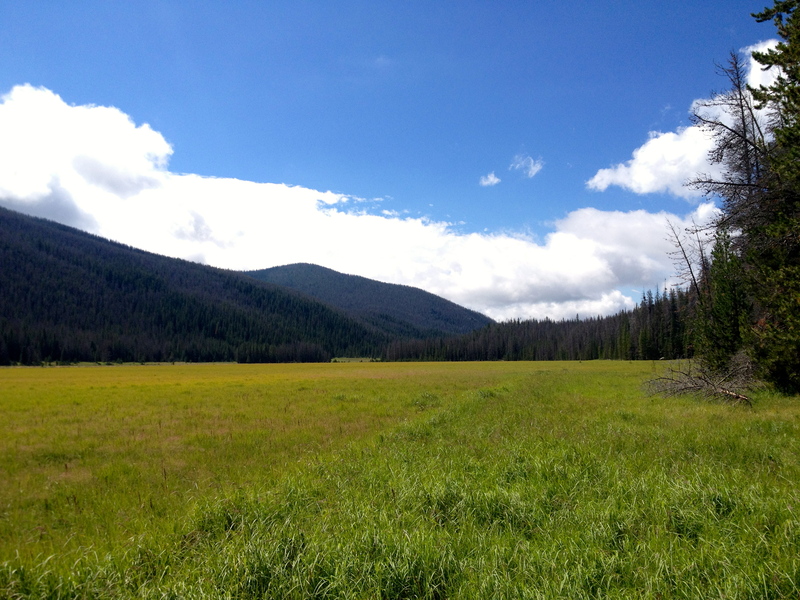 While my favorite portion was the alpine hike through the cairns along the Continental Divide on Day 3, there is no question that there was something refreshing and reinvigorating about falling below the tree-line and then walking out into a vast green meadow. 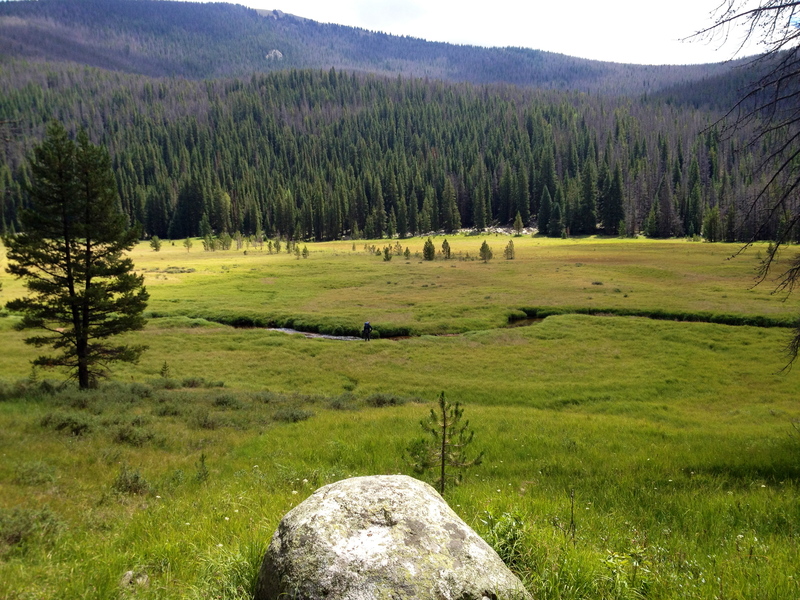 Big Meadow makes you take off your pack and stand still… so the calming breeze can envelop you. 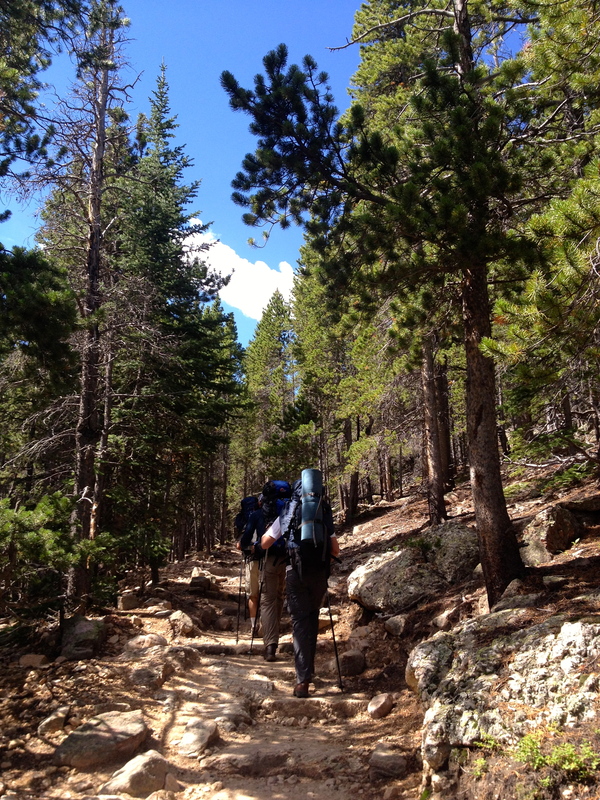 The homestretch of our nine-mile trek took us back through the pines. There were not many exciting moments on this day, it was just a peaceful hike back to the TH. 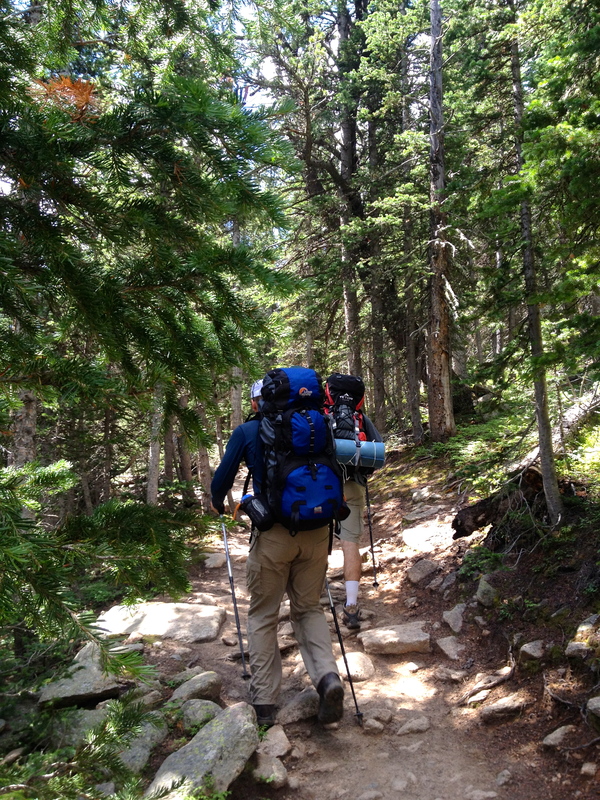 As we approached the parking lot to wrap up North Inlet/Tonahutu Loop Trail, our minds were already thinking about the next day when we would be tackling Long’s Peak, the highest peak in Rocky Mountain National Park at 14,258 feet. Day five would have us hiking over 3300 for five miles to camp at the Boulderfield, which will be by far the coolest camping spot to which I have ever been. I thought about simply jumping into our Rocky Mountain trip- posting the route, the photos, and descriptions… but realized very quickly that if a group of people decided to do this exact trip it would be incredibly beneficial for me to discuss our exhaustive planning leading up to it. I am all about over-planning, especially when it comes to backcountry hiking. There are just so many variables that can go the wrong way and lead to a less than successful hike. 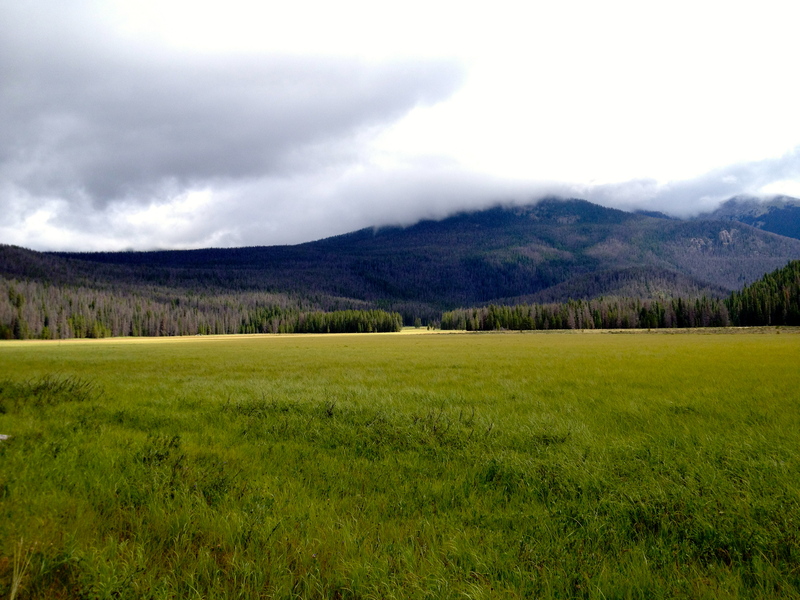 The planning for our trip to Rocky Mountain National Park in Colorado began within a couple of months of finishing the Shenandoah National Park backcountry hike last year, which would have been around September. Some may say that planning ten months in advance is overkill but keep in mind that once a backcountry route is chosen you just don’t show up on the day of the hike and camp anywhere you please. 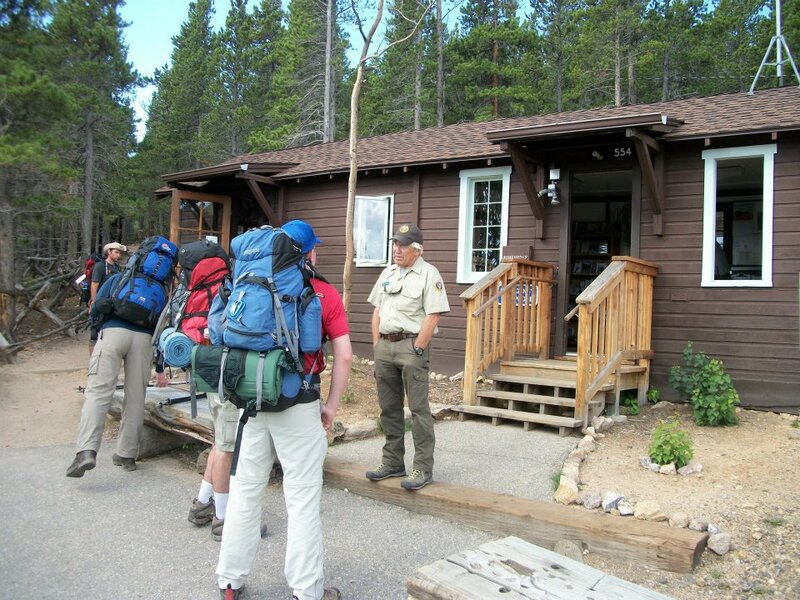 Within most national parks, backcountry permits are required and backcountry camping spots are limited. So it is wise to begin mapping out your route sooner rather than later so you know which backcountry camping spots you need to reserve. Based upon my experience, these spots go rather quickly. 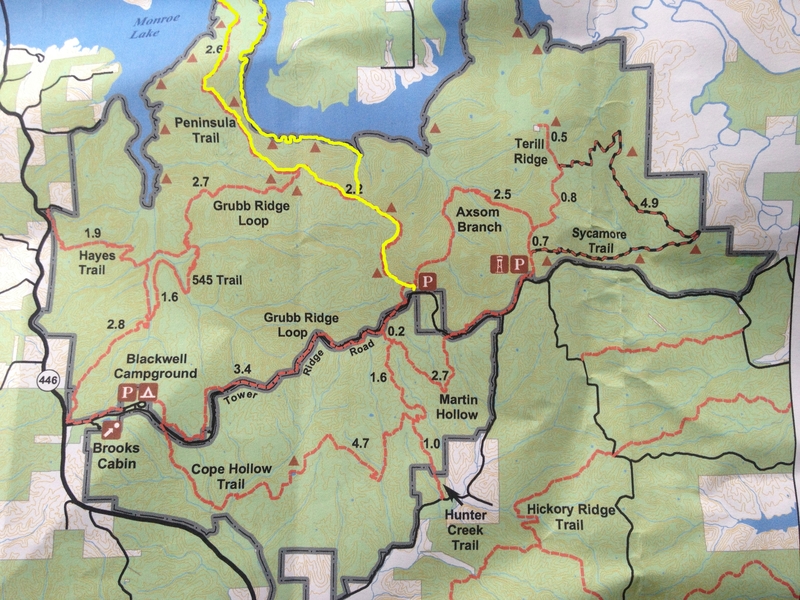 The initial hiking route that I mapped out was scrapped because I could not secure the two backcountry campsites. So plan in advance…and have a contingency plan! I sent in the second planning worksheet, which included the backcountry campsites we were wanting to reserve, and our detailed day-by-day logistical plan around January of this year. I then called on March 1, the day reservations are slotted in the backcountry office, to ensure that we got the spots we requested. We ended up getting every spot that we wanted to reserve on the loop trail. Once we decided upon the North Inlet/Tonahutu Loop Trail, we charted out elevation and mileage in order to get a sense of which backcountry campsites were reasonable for each day’s hike. Being that we were coming from a low elevation state, Indiana (650 feet), we knew that it would be wise to have a couple of days to acclimate to higher elevation. 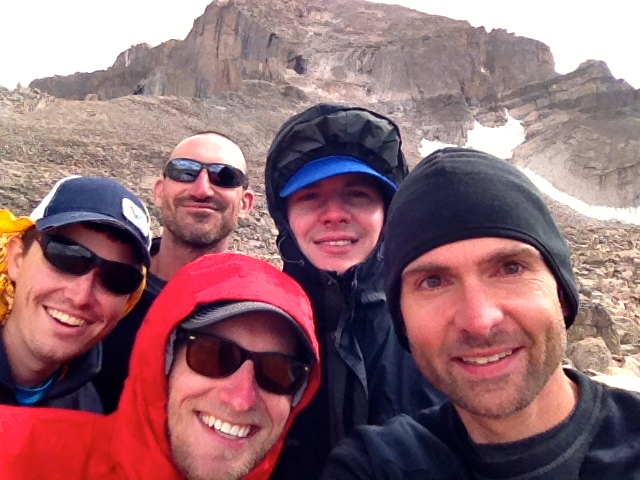 With five guys in our group, we wanted to minimize altitude sickness at all costs. What affects one person in the group… affects the entire group. 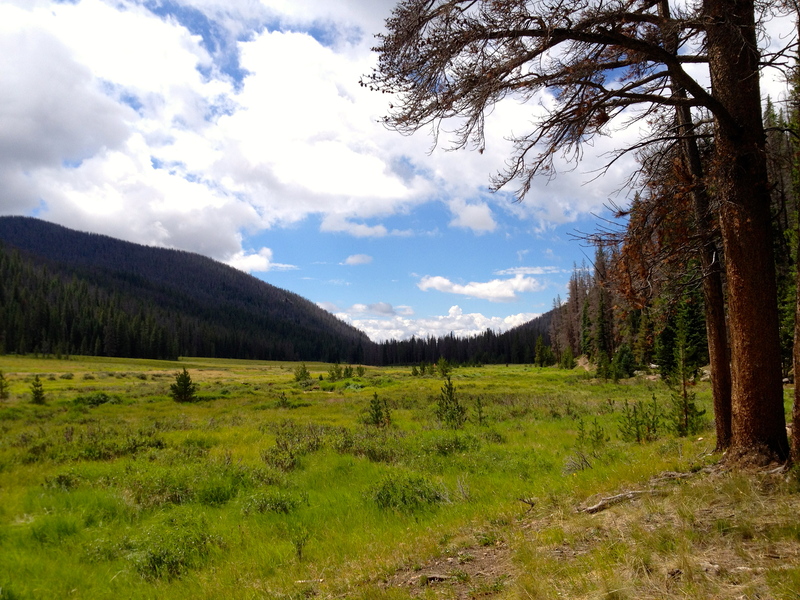 As a result, we arrived in Denver (around 5000 feet) on Saturday, started our hike at the North Inlet/Tonahutu trailhead (8900 feet) on Sunday, and only hiked three miles with 300 elevation gain the first day. This allowed us a couple of days for our bodies to adjust and it turned out to be a wise plan. One other consideration that we took into account was taking altitude medication. Of course this is something that should be discussed with your physician, but it is an invaluable option if you come from the lowlands. I had a physical prior to the trip and asked about medicating to avoid altitude sickness. As a result, my doctor prescribed Diamox, Aleve, and Aspirin to prepare my body for high altitude. Over the course of 50 miles hiked and several thousand feet in elevation change (5000 to over 14,000 feet), I never once felt the effect of high altitude. To me, this is good planning for a successful trip. 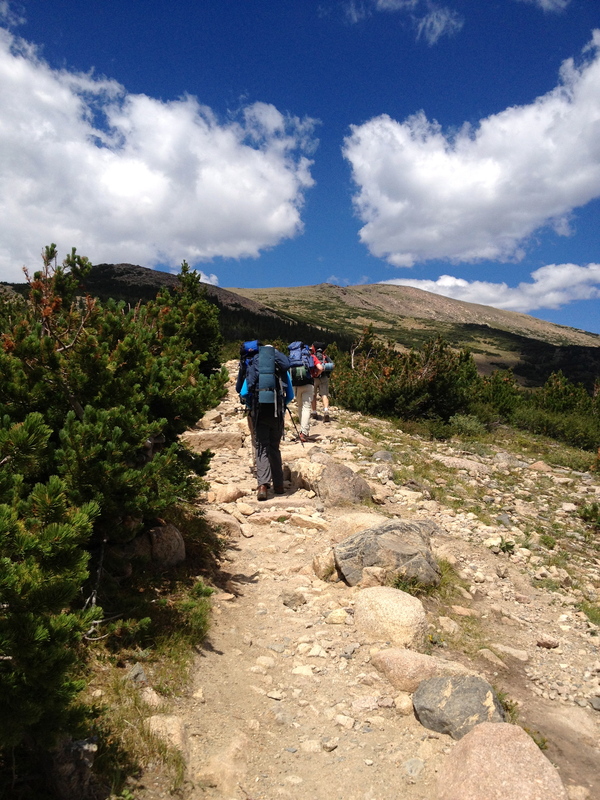 In fact, not one person in our group was debilitated by altitude. 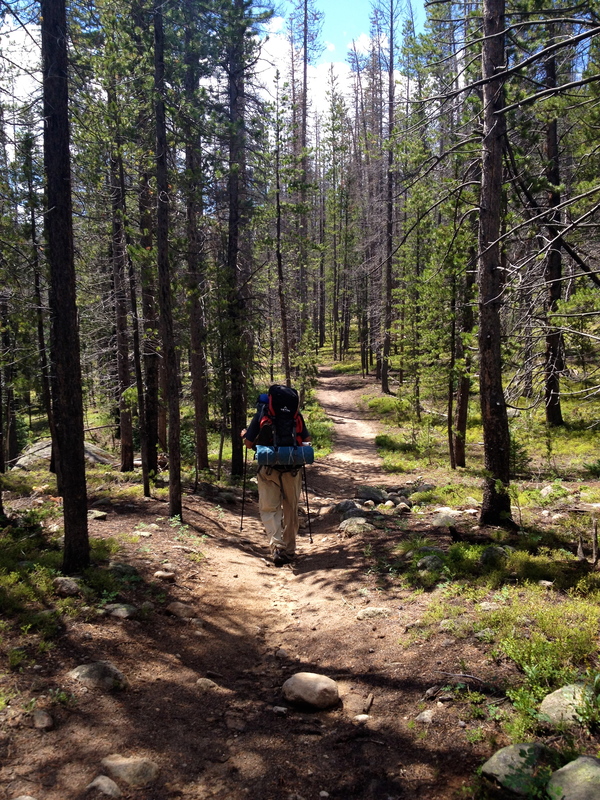 In my opinion, packing is one of the most important factors for a successful backcountry hiking trip. There are so many factors to consider, especially when hiking at higher altitudes with significant changes in elevation from day to day. Here is a quick story to prove my point. 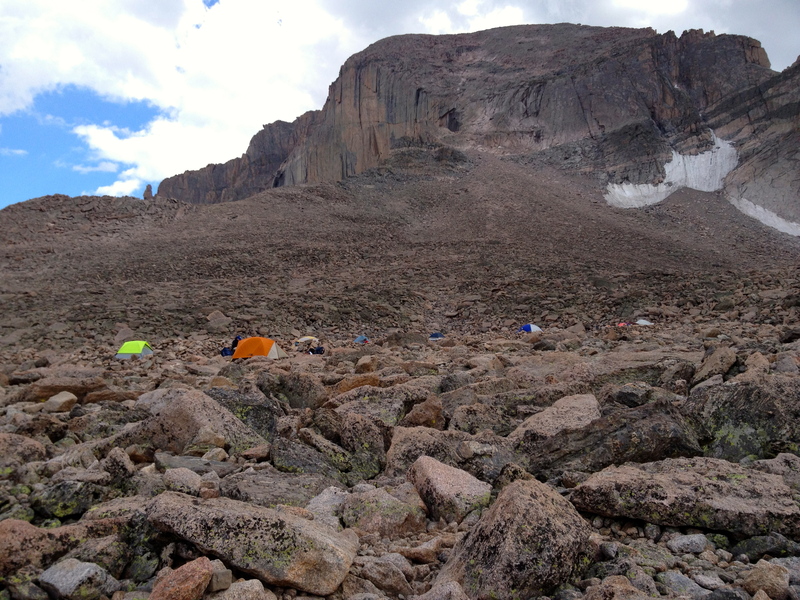 We arrived at the Boulderfield (13,000 feet) in the early afternoon and set up camped while the sun was still out. This is incredibly rough terrain, but even more difficult to navigate through at night. The sun had already gone down and we were waiting to watch the stars above when we saw movement on the horizon. As the movement got closer we realized it was two guys hiking through the Boulderfield without headlamps. One of the guys in our group greeted them and asked them what they were doing. 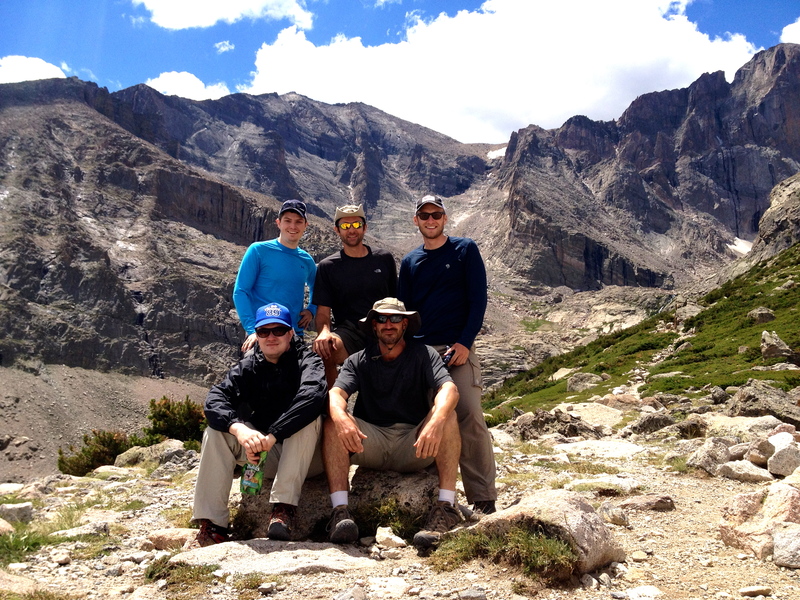 The teenagers explained that they had recently moved from Florida to Colorado and were wanting to tackle Long’s Peak (14,258 feet) the next morning. Upon further conversation, it was discovered that one of the guys forgot his sleeping bag and neither of them packed a tent. It is important to note that the last temperature reading I took from the Boulderfield that night was 44 degrees. Improper planning can put a person or a group in serious danger. Make a checklist of all the items you could potentially need… then double and triple check as you pack. Water– dehydration is a significant concern at high altitude. Pack a water bladder, a couple of Nalgene’s, and some way to filter or clean water that you collect from streams or rivers. We not only packed two water filter pumps but also Iodine drops. 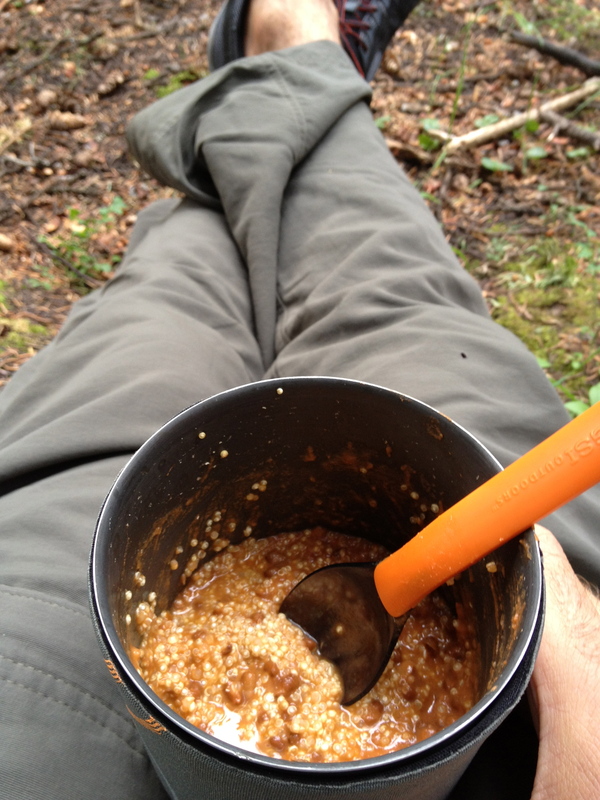 Food– the two most important considerations for me is weight of the food and protein. I try to pack as lightly as possible with the maximum protein content as possible. For this trip I packed five small bags of almonds and dried cranberries, which I kept accessible throughout the trip. I also packed several high protein Clif bars and pouches of tuna. For supper, I packed super protein food Quinoa and ate it with some prepackaged high protein Indian cuisine. Those are my preferences and yours may be a bit different. One of the guys in our groups sometimes has low blood sugar… so he packs jelly beans. Think about yourself and your individual needs, but make sure that you pack just what you need. I can assure you that you do not want a ton of extra food weight in your pack that you will never eat. 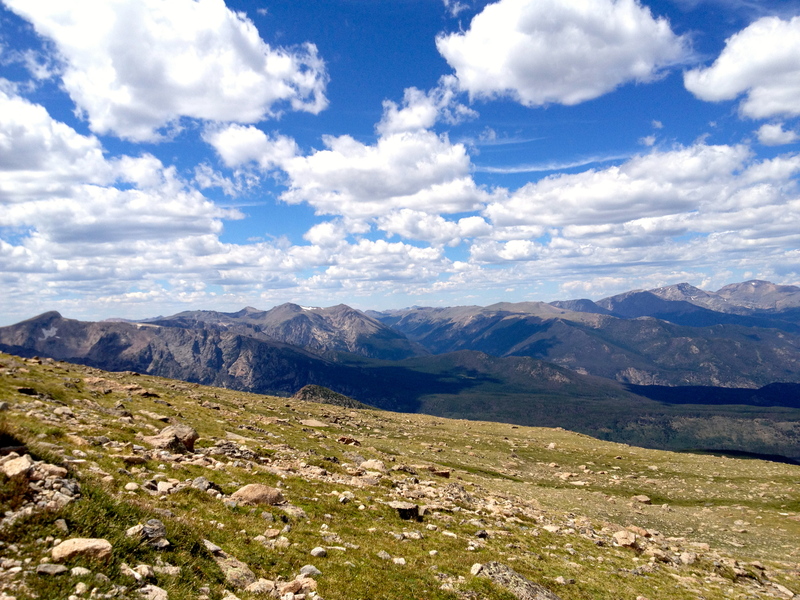 This is no longer an option in Rocky Mountain National Park. You have to buy or rent bear canisters in which to put all of your food at night. With a quick search, you can find out the retailers that rent these canisters. – Avoid cotton clothing at all costs! It absorbs water, does not breathe well, and takes forever to dry. Get clothing that is designed to breathe and dry quickly. You will thank me later. – Pack a rain jacket! Rain can come upon you at any moment. I packed a light water and wind proof jacket and always had it at the top of my pack just in case. – Consider hiking pants with zip off legs that turn into shorts. With changing temperatures you do not want to stop and have to do a complete clothing change. Make it easy on yourself! – Be prepared with longer sleeve options. Again, I like the breathe-able stuff with UV protection. If you are going to be at higher elevations you have to consider that it could be 20 to 30 degrees cooler than what it is at lower altitudes, especially at night. Don’t overpack, but find a light long sleeve shirt and a heavier long sleeve and you will be in good shape. – Your feet are your most important asset. Without feet that are taken care of… your hiking will be limited. Get a nice durable pair of hiking boots with Gore-Tex and Vibram soles. I prefer boots that go above the ankle for additional support. 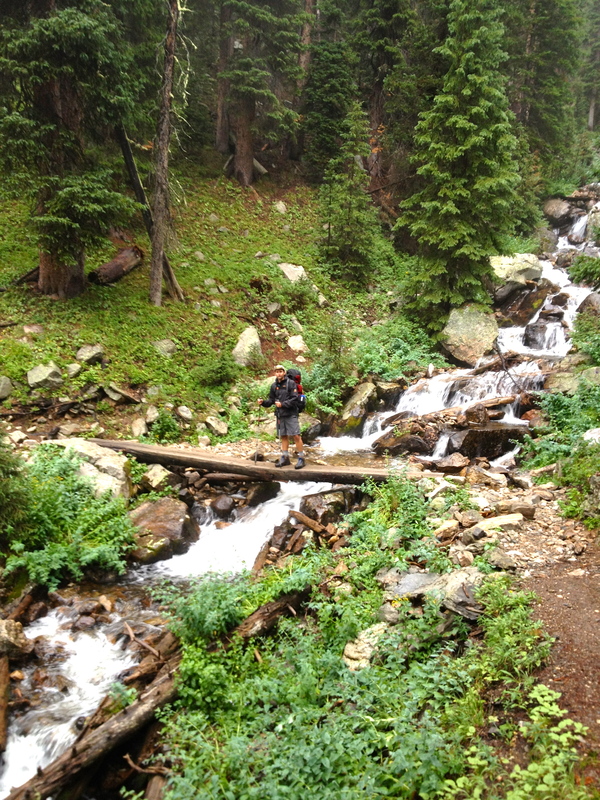 The Rocky Mountain trails can be brutal on your ankles. – Make sure to pack some UV sunglasses. UV radiation is significant at higher elevations. – Cover your head with something. Pack a hat, bandana, etc. 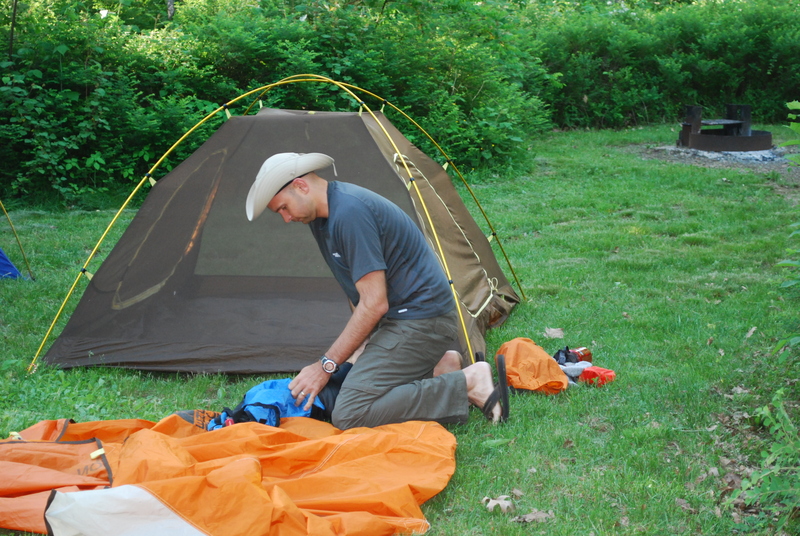 – Limit pack weight by bringing tents for the exact number of hikers in your party. – The camping terrain varies significantly from spot to spot. Make sure you have an inflatable ThermaRest. They pack very small and are light. It is worth every penny in my opinion. – Trekking poles, for me, were one of the most essential items I took with me. I cannot underscore how important they were for me. 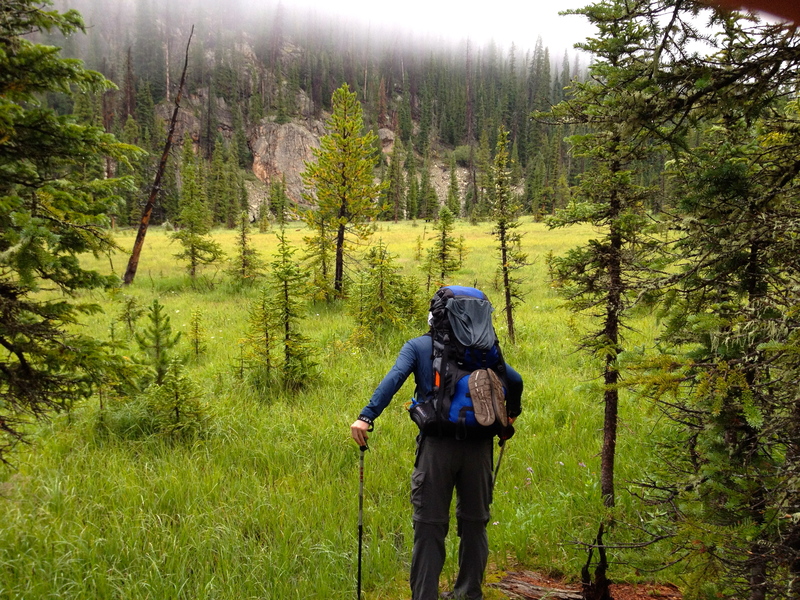 If you haven’t used trekking poles before, I would highly suggest doing some research and getting a pair for yourself, especially if you are doing significant backcountry hiking. There are other items to consider, but these are some of the essentials that we packed for our trip. Of course, not every person needs to pack every single item. 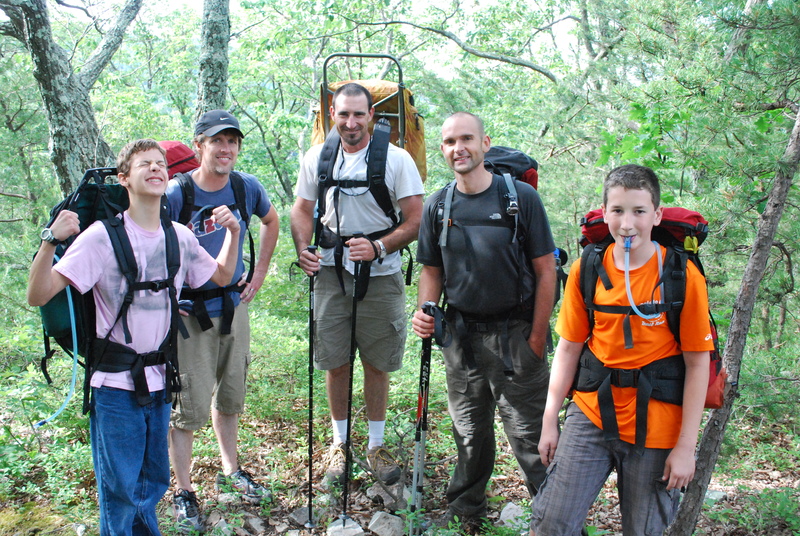 Sharing with your group also reduces pack weight. It is also wise to do research in advance about having campfires at your destination. Since campfires were only authorized in designated firepit areas in RMNP (none of which were at our backcountry camping spots)… we had to plan accordingly. Each of us brought our own Pocket Rocket portable stove for cooking. What other items do you think are essential? Please share what you pack. Everyone seemed to be in good spirits at the beginning of day two. Although we were making breakfast, pumping water, taking down the tents, and having fun ribbing each other…it was as if there was something unspoken hovering around and weighing on us. 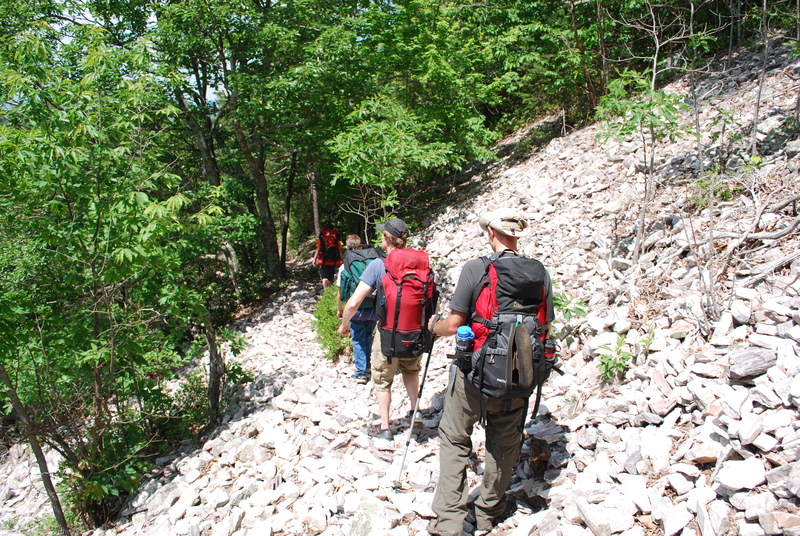 The Furnace climb was awaiting us…and this time it was with our heavy packs. Our only consolation was that it was early and cool. We knew the sooner we got started the better off we would be. So after waiting on Kfed and his primping and Chase and his urinating…we were ready to climb. It was actually very surprising how refreshed I felt after a good night sleep. We didn’t have to worry about bears, as we “bear bagged” our food quite a ways from the tents. Sleeping all night beside a calm and monotonous stream can do wonders. So it was no wonder we seemed to be climbing quickly with relative ease. The summer trees and mountain laurel in the early morning felt like a gift. As we climbed the ridge toward Trayfoot Mountain, a fresh summer fragrance led us. This was what a morning was meant to be. This is what every human being should get to experience everyday. Were my legs burning? Was I breathing heavy? Was my heart beating rapidly? I have no idea. I was in heaven. We took a short break on a rocky ledge of Trayfoot Mountain. It was a relatively short break but the view was fantastic. We could see the valley and several other ranges for miles, even a small town with a train passing through. At nightfall we would be back to this area to look at the stars. We covered about eight miles before reaching the creek at Paine Run. We were all eager to take our socks and shoes off and cool them in the water. After cooling down we scoped out the potential areas to camp. 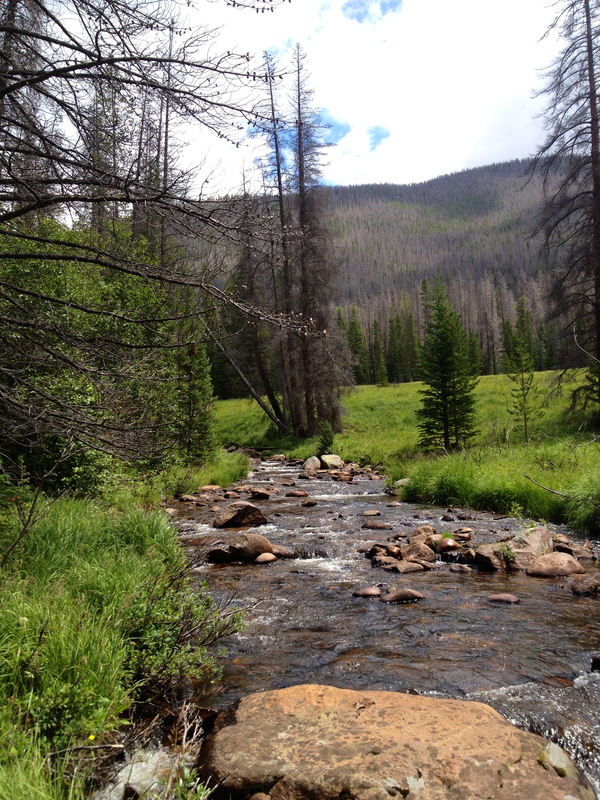 We settled on the ideal location on an embankment just off the trail and close to the creek. We set up the tents, made a fire, pumped water, ate, and made preparations to take a late evening hike back to the rock slab on top of Trayfoot in order to stargaze. With headlamps in place, we started off for our nighttime show. The evening air was cool and our climb was brisk. It wasn’t long before we arrived and worked our way out onto the weathered rock. We were lost in conversation as the night grew darker and the stars grew brighter. What an immense canopy blanketing us. I felt so small and so overwhelmed. God is good. As we arrived back at base camp to close out our second day, we sat around the warm embers and talked about our day. A voice that we didn’t recognize called out from the trail, “You guys have any beer?” He kept walking and we just laughed. Where did he come from and where was he going? We may never know. It was time to hit the sack. Our most exciting summit was coming the next day- Blackrock Summit. 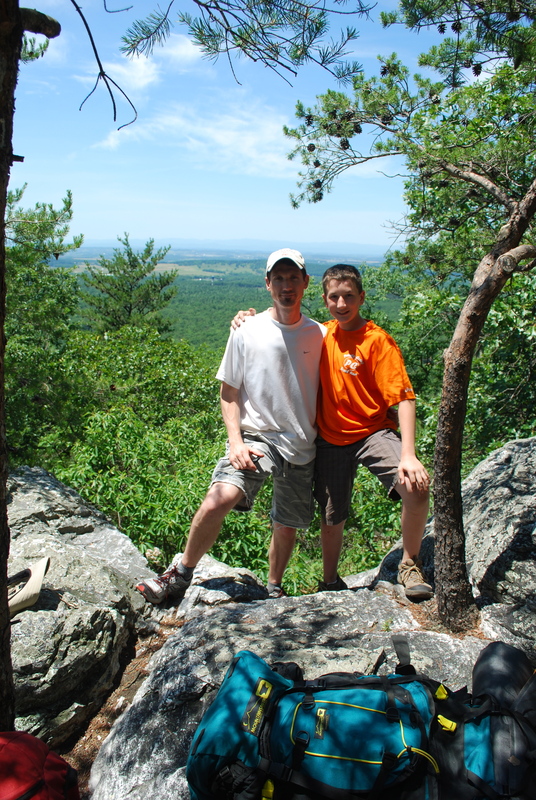 At the beginning of June 2011 we headed eastward to the Shenandoah National Park near Harrisonburg, Virginia. 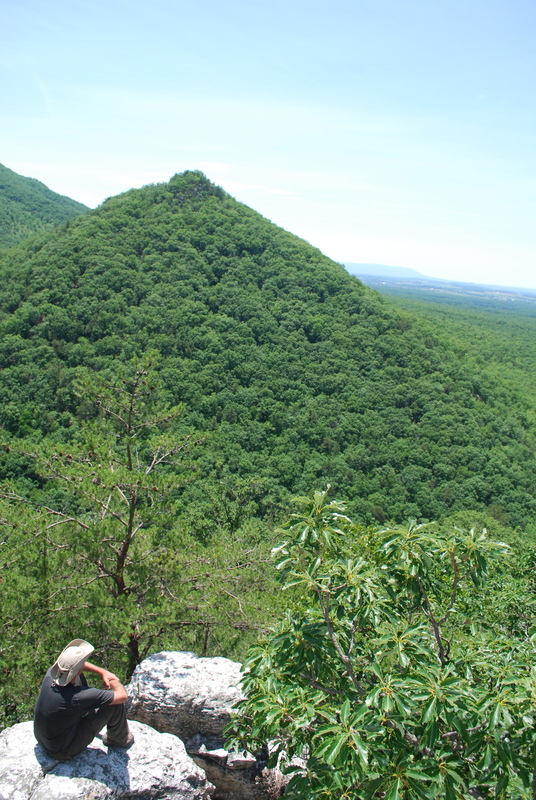 We were planning to hike the trails around and up Furnace Mountain and Trayfoot Mountain. This was exciting as this would be our first hiking and camping trip east of Indiana. The last two trips were in the Buffalo River region of Arkansas and the Ozarks in southeast Missouri, both of which I plan to write about in the near future. There were a total of six guys on this trip and the plan was for two of us to arrive early and set up camp before the other four arrived later in the day. Kfed and I arrived at the Loft Mountain Campground in the National Park about seven or eight hours earlier than the rest of the guys. 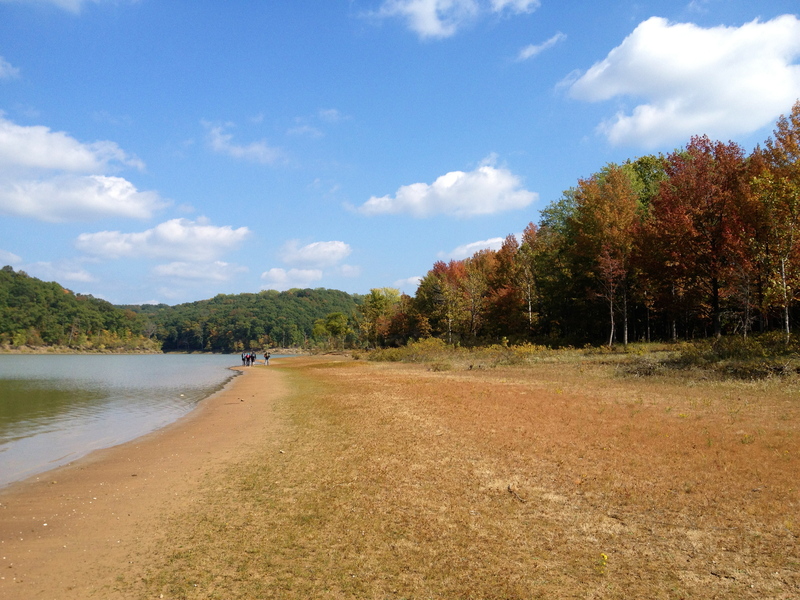 We chose this particular campground because it was a short drive to our beginning point at Jones Run parking lot (where we would leave our vehicles) and the Appalachian Trail (AT). After promptly spraying ourselves against the attack of the mosquitos, we set up both tents and started a fire. Being that we were on top of Loft Mountain the wind was quite strong all night long. It didn’t pose a problem and we actually enjoyed it. The rest of the guys arrived about 1:30 am and immediately ducked into their tent for an early morning start. 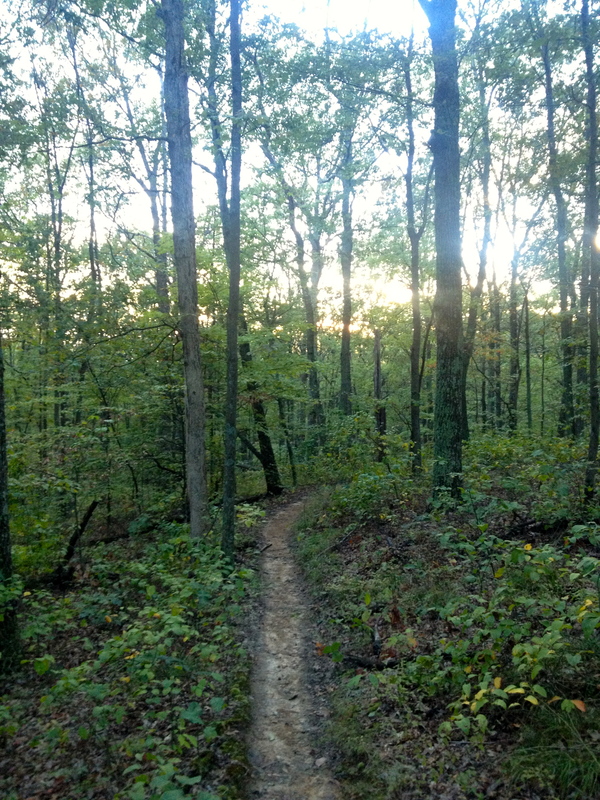 Our plan was to hit the AT near Jones Run parking lot and head northeast toward Austin Mountain Trail via Big Run Loop Trail and Rockytop Trail and end our first day of hiking streamside near Madison Run Fire Road. The weather could not have been better. It was a cool, crisp morning. The wind had significantly died down and the sun was awaking over the horizon. It was going to be ideal hiking conditions (but what isn’t right?). After enjoying some brewed coffee and trail mix we loaded up and headed out. 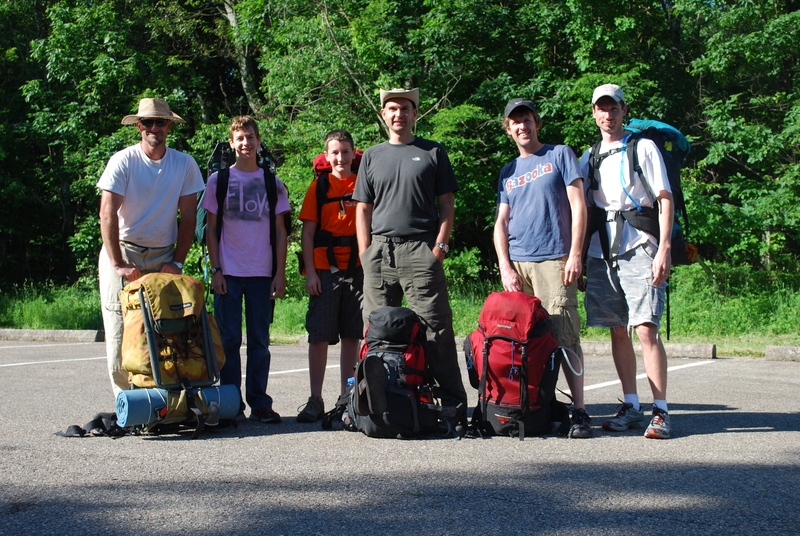 We geared up, took some pics, and then headed northeast on the AT. 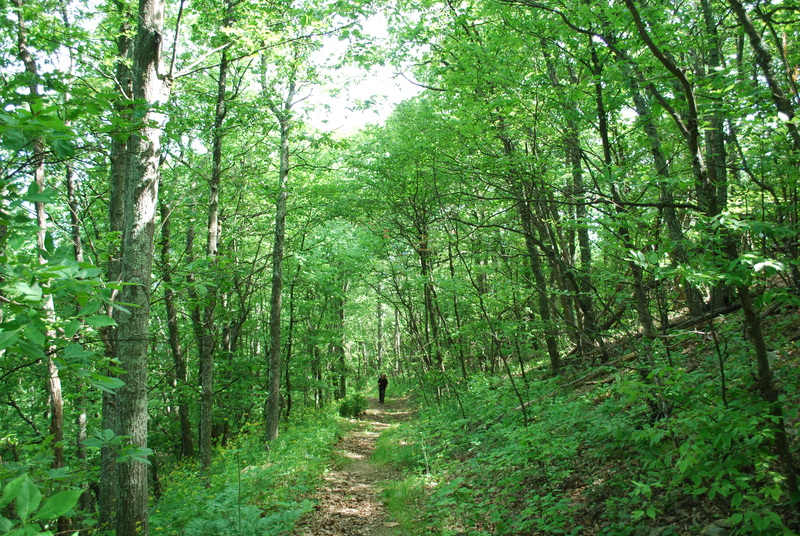 If you have done much hiking, you will appreciate how well maintained these trails are. In fact, there are not many parts of the Furnace Mountain/Trayfoot Mountain trails that require long pants. You could easily get by with shorts, but I conservatively chose to wear my Paramount pants (The North Face) that could easily zip off into shorts. After getting 17 ticks the previous year in Arkansas and having severe reactions to poison ivy, I always try to play it safe. The first day we covered about 6.5 miles and descended from about 2800 feet to about 1300 feet. I am always leery of starting a multi-day hike going down rather than up. I usually have the most energy and excitement at the beginning and would be better off taking the big stuff early. There were not many opportunities on this first leg for great views because of the overgrowth. 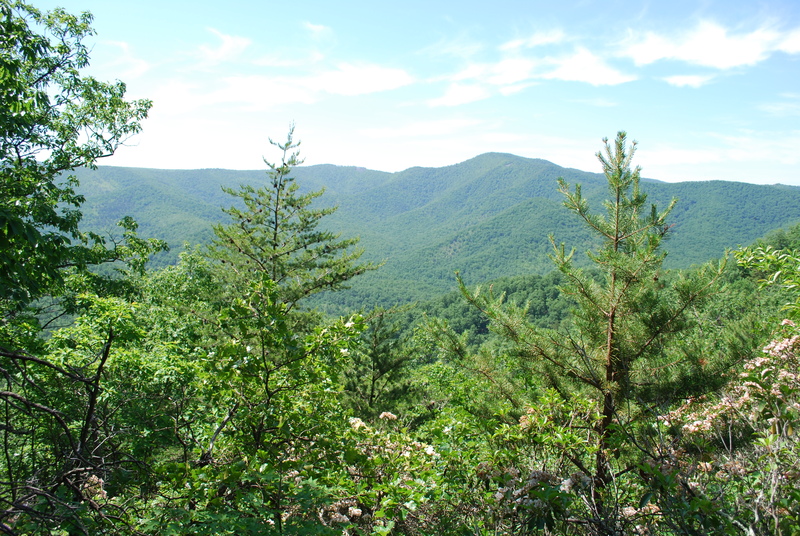 We stopped for a snack and water break a couple of times when it opened up a bit to see Austin Mountain and the Shenandoah Valley. 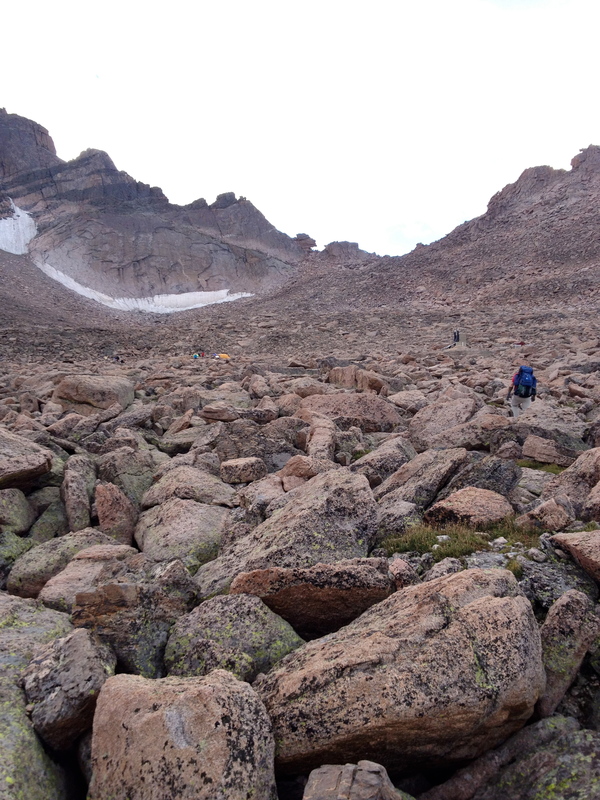 We crossed some areas with thousands of broken granite rocks each the size of a tissue box. These areas were hard to walk on but we passed through quickly. 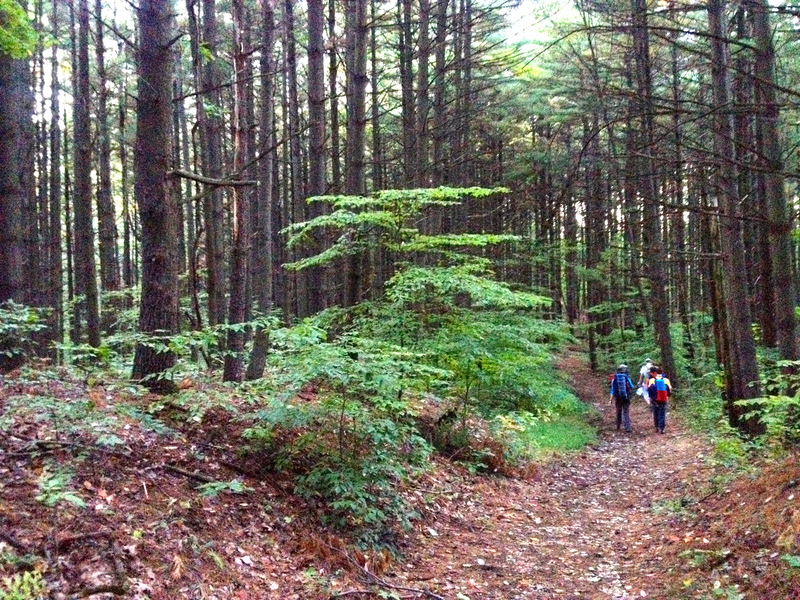 The final descent drops about 500 feet in less than a half-mile and leads directly to the stream near Madison Run Fire Road. Everything we read spoke of several camping spots in this area. Unfortunately, much of it was posted off-limits due to over usage. 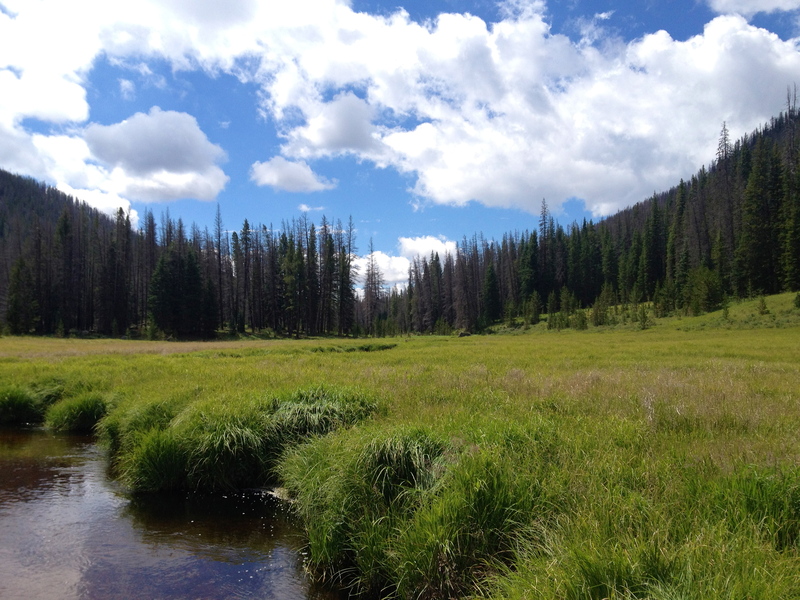 We eventually settled on an area downstream and set up camp. Our plan was to set up camp, pump water, and rest a bit before taking a hike without our gear to the summit of Furnace Mountain. We did just that- we set up camp, pumped several gallons of water from the stream, cooled our feet off in the cold water, brewed some coffee, chilled out a bit, and then began our late afternoon ascent. 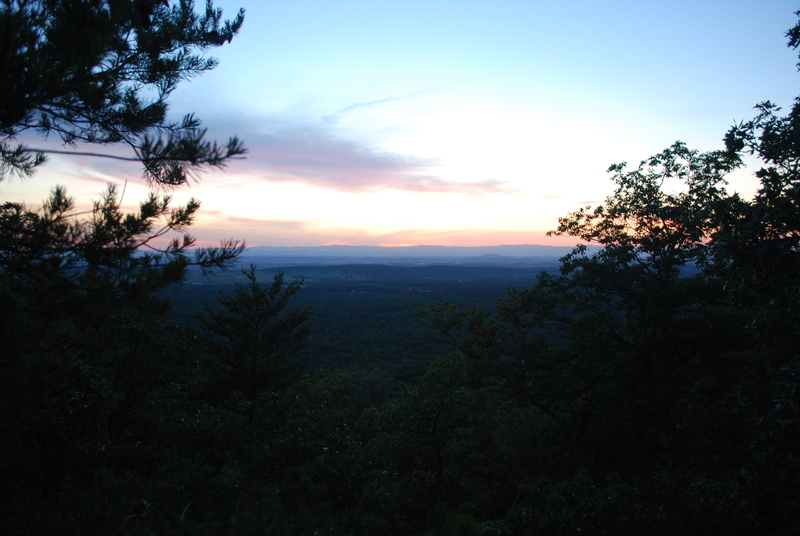 I will write about Furnace Mountain in my next post…but let me say one thing before I get to that: Furnace Mountain earns it’s name rightly as you feel as if you are in a furnace climbing in the early afternoon with the sun scorching your back.